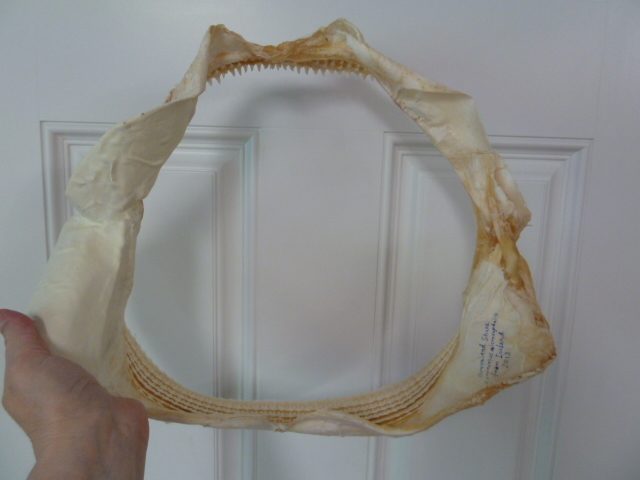 Also known as the Gurry or Grey shark or by the Inuit name Eqalussuaq, is a large shark of the family Somniosidae ("sleeper sharks" that is native to the waters of the North Atlantic Ocean around Canada, Greenland and Iceland. 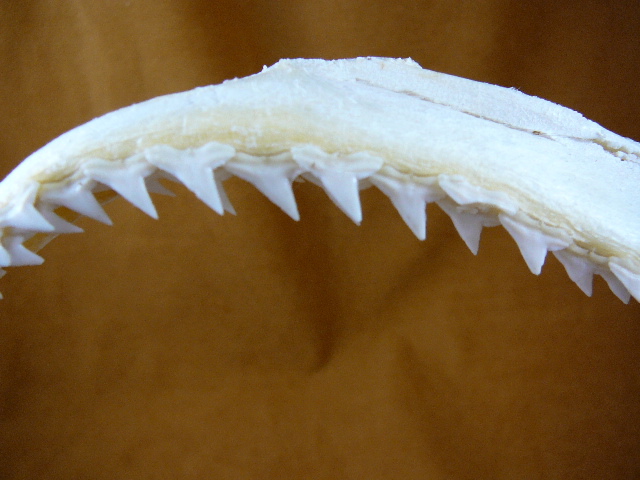 These sharks live farther north than any other shark species, adapted to be a truly sub-Arctic species of shark. 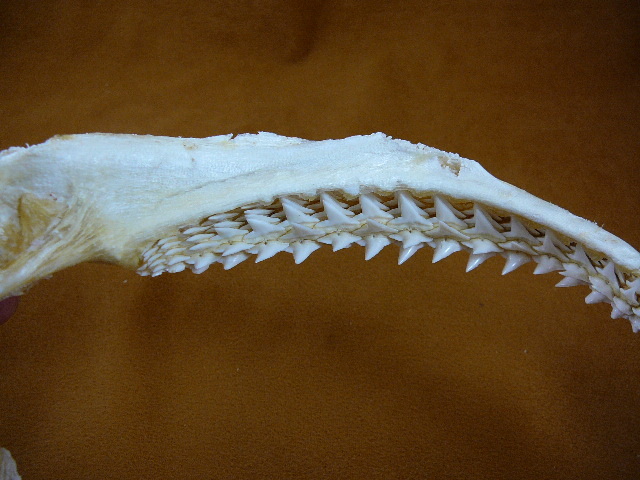 Closely related to the Pacific sleeper shark. 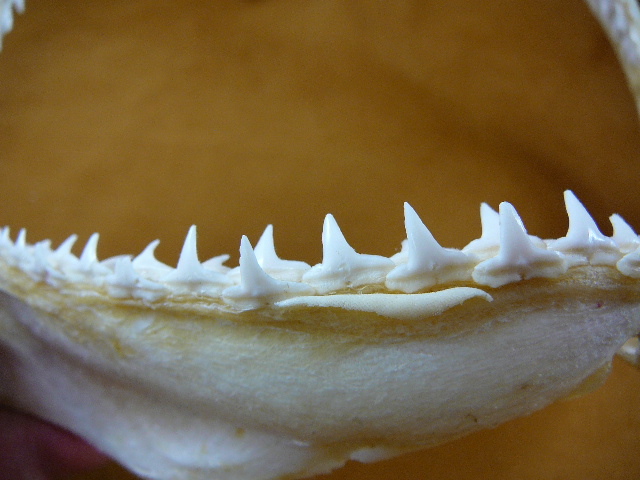 It holds the world record for having the world's most toxic shark meat due to the high ammonia content (which is fermented and eaten in some circles as "rotten shark". 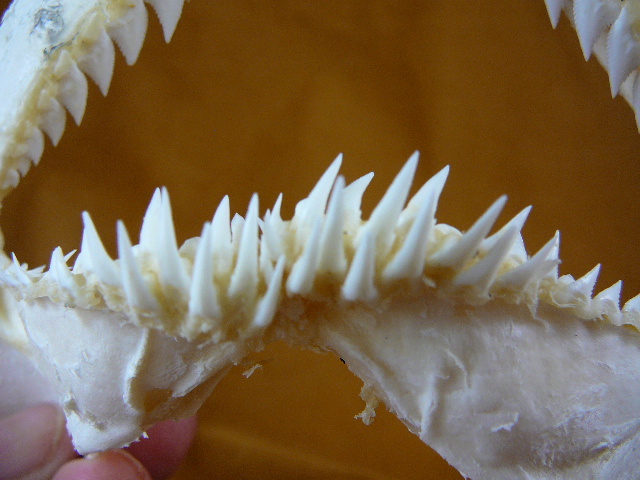 It grows to 21 feet and 2200 pounds, similar in size to the Great White shark. 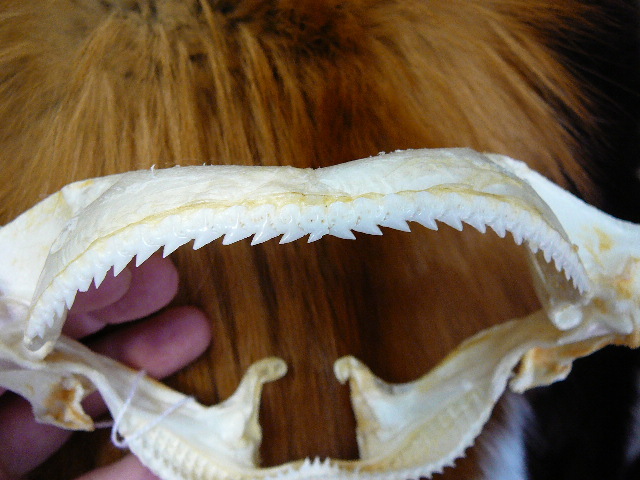 It uses a rolling motion in catching prey which severs the flesh with its many layers of teeth that have no serrations. 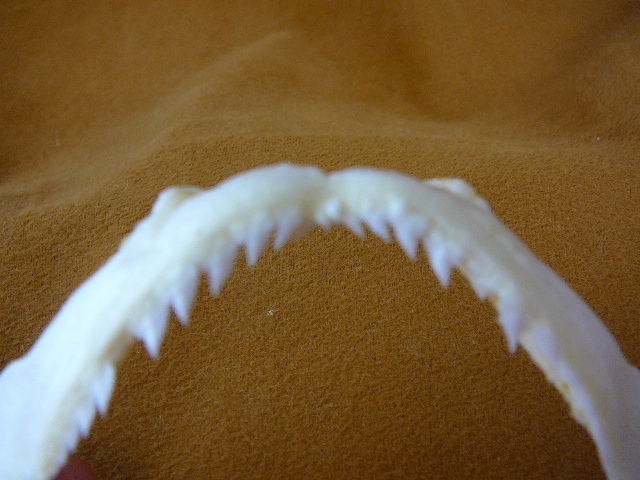 It is an apex predator. 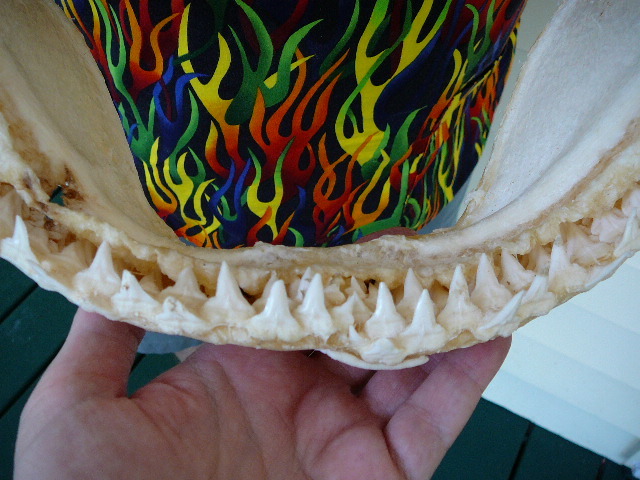 The 8 lower rows of teeth are spectacular. 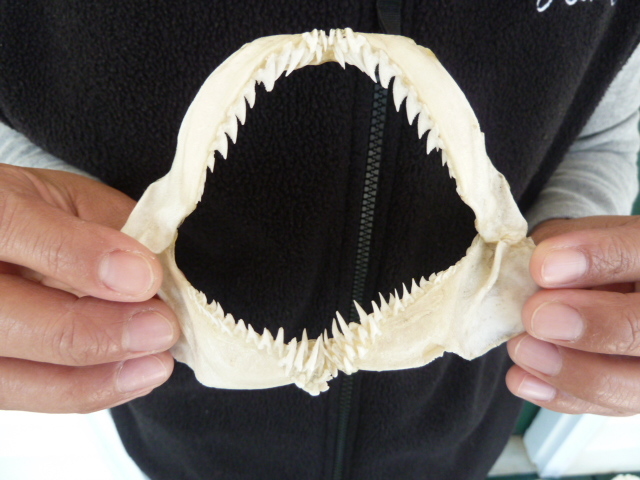 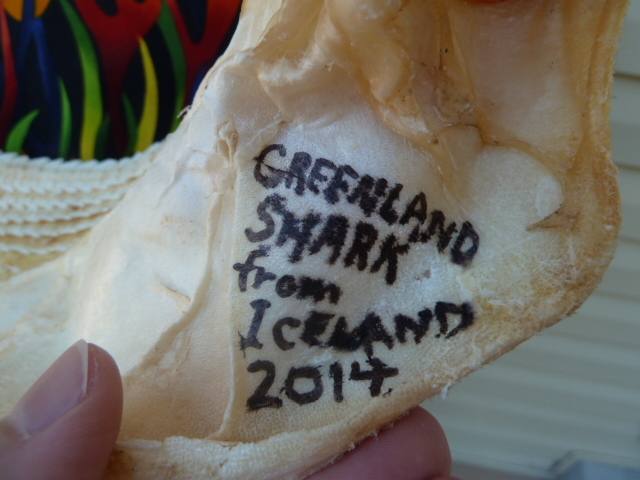 Greenland shark expert remarks: "The mouth is really strange in these sharks. 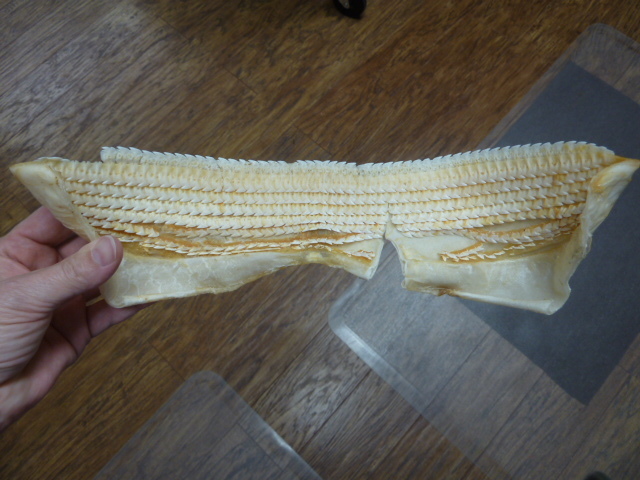 It's very plastic. 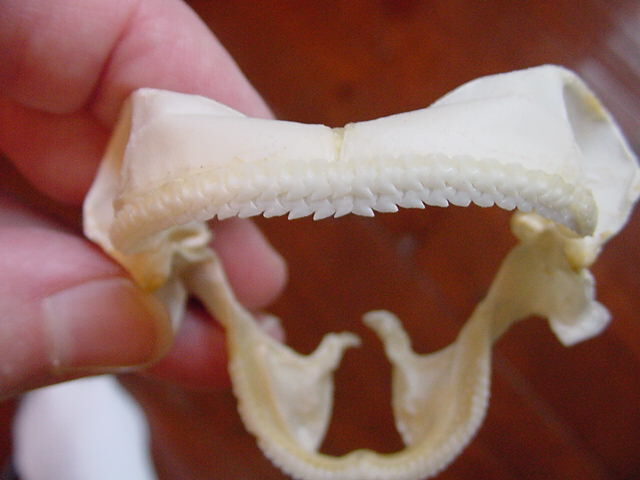 They can change the way the mouth functions by moving muscles around the mouth. 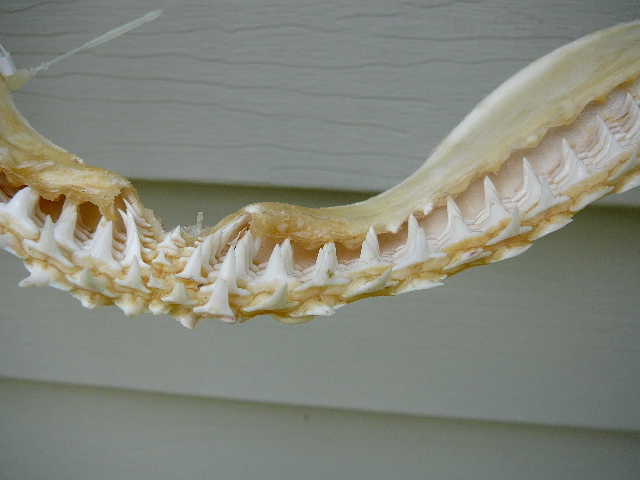 So they go from inverting or turning the mouth inside-out like a catfish can and make a big suction apparatus to rotating the teeth outward and driving the teeth into prey." 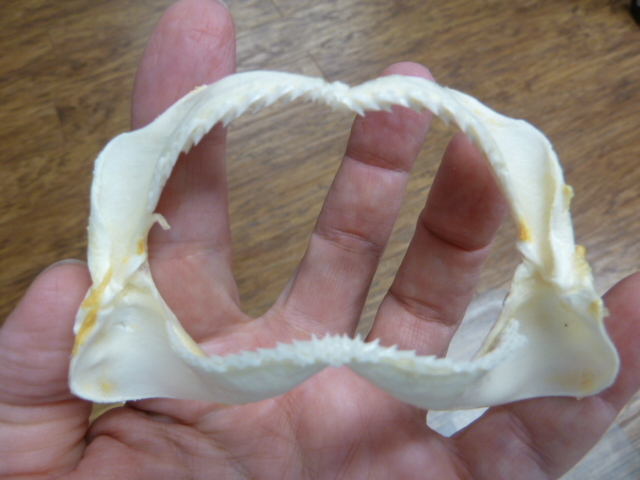 He said the bite of a Greenland shark is unmistakable. 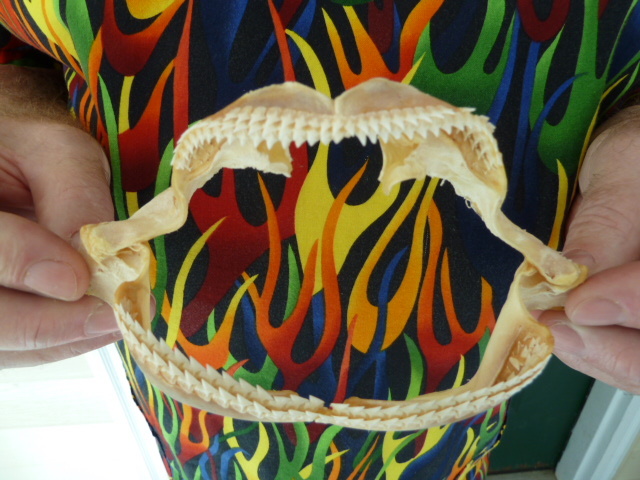 "They drive their teeth into prey, and they basically do a headstand on the prey, and they oscillate their body back and forth like a big auger. 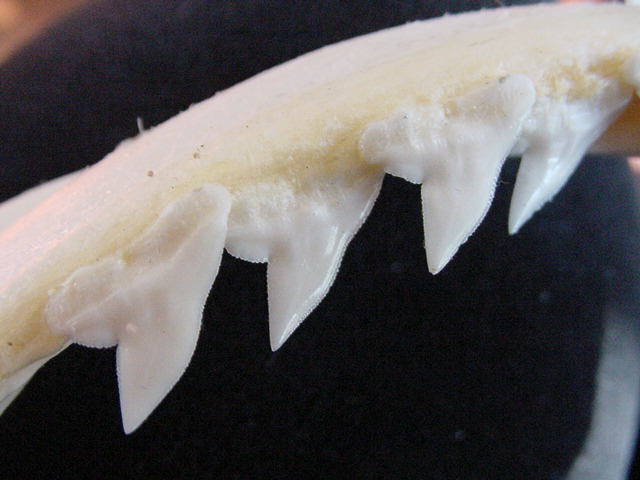 What they're doing is they're driving their jaws through their prey and they're taking this big ice cream scoop shape that's very neat and clean. 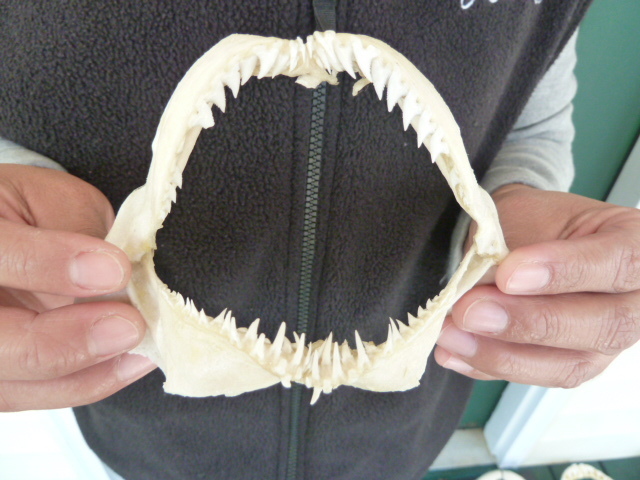 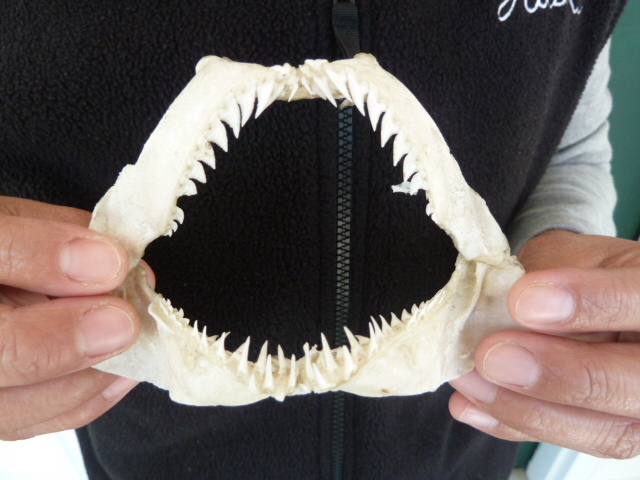 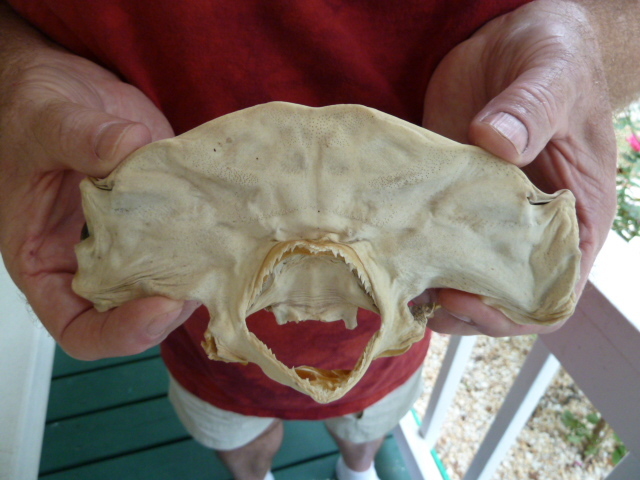 Greenland shark bites have a very characteristic look," he said. 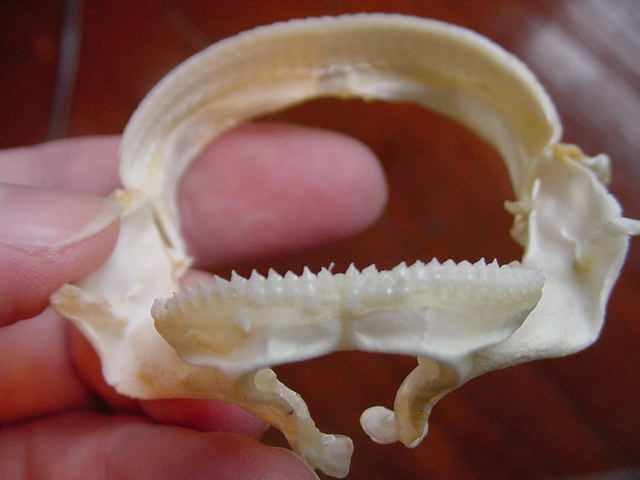 "I refer to them as Swiss Army knife predators - and they're really both a predator and a scavenger, and hence kind of the hyena of the deep." 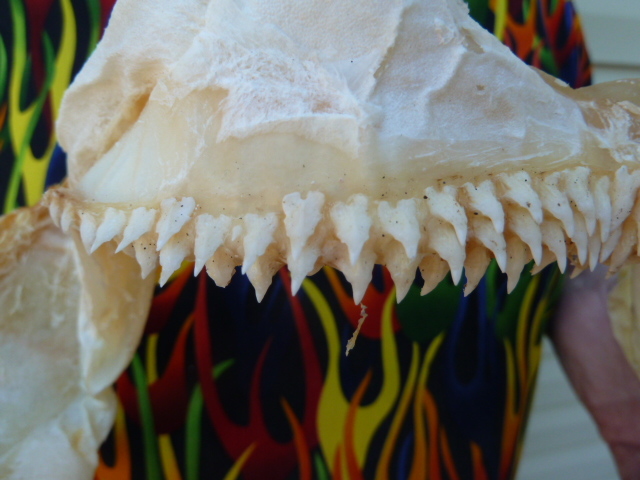 The sharks also have an incredible sense of smell. 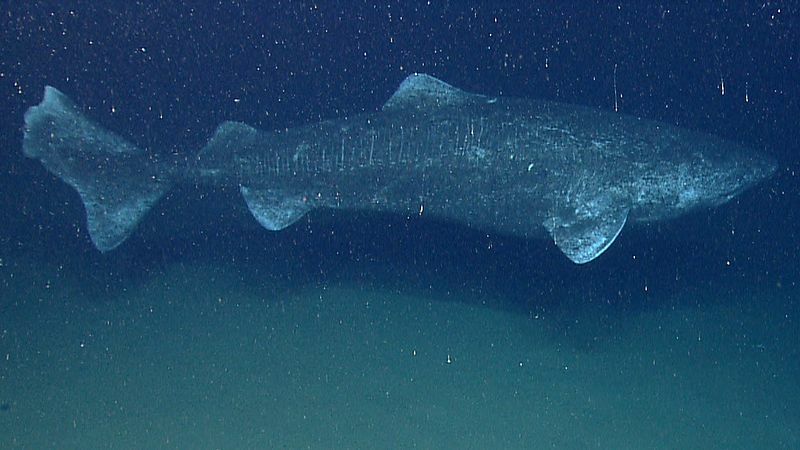 The "super sniffers" are able to find food in the pitch black depths of the deep sea where they're thought to spend most of their time. 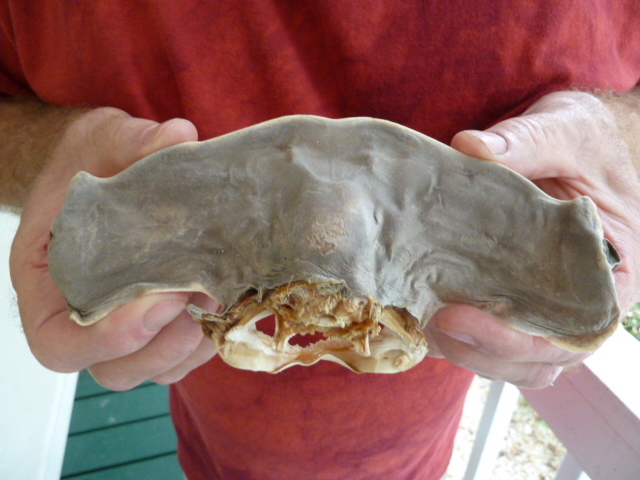 "In fact, they've been called giant swimming noses." 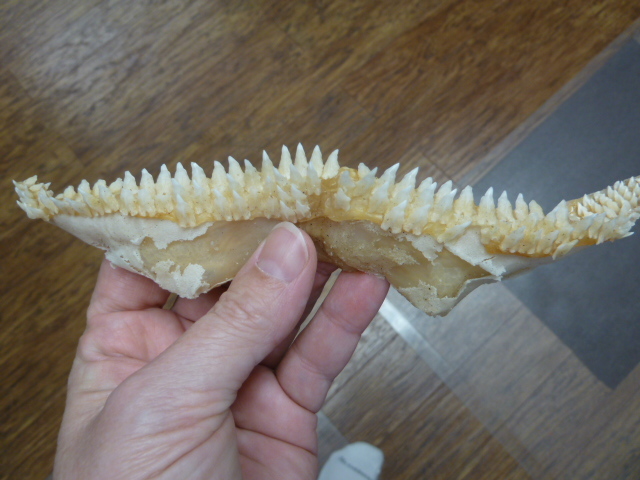 This specimen is from Iceland, professionally prepared by Rick Stringer. 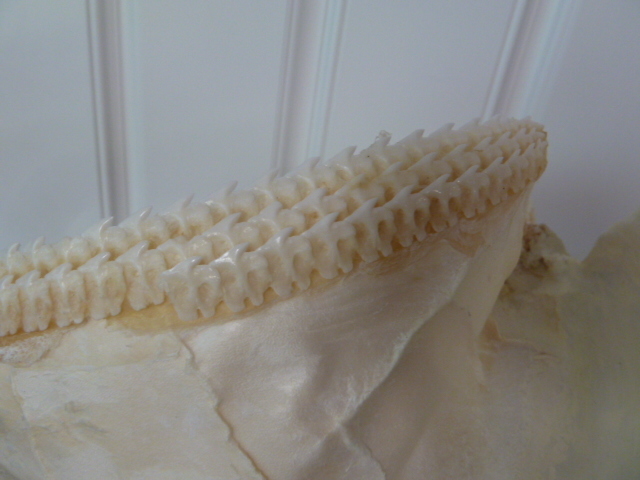 Upper measures 17-1/2" wide following curvature, 12" wide linear, x 3-3/4" tall. 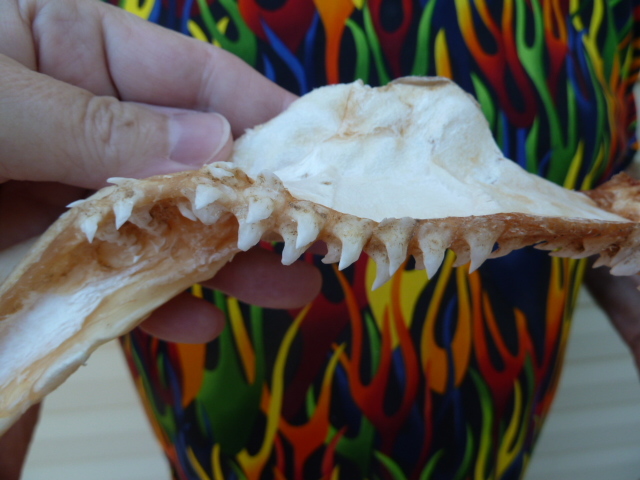 Lower measures 8" wide linear x 1-1/2" tall. 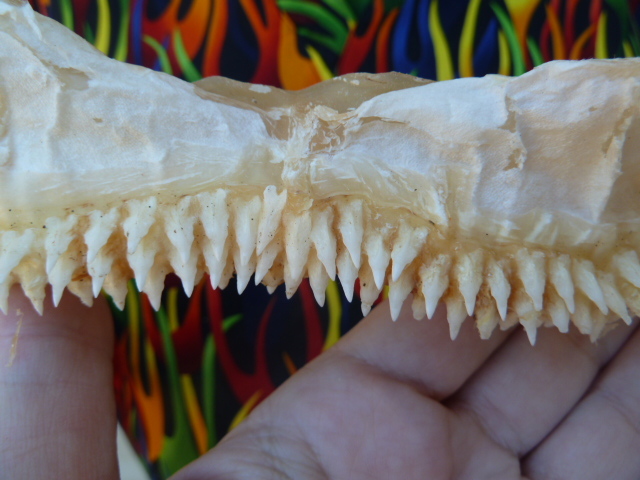 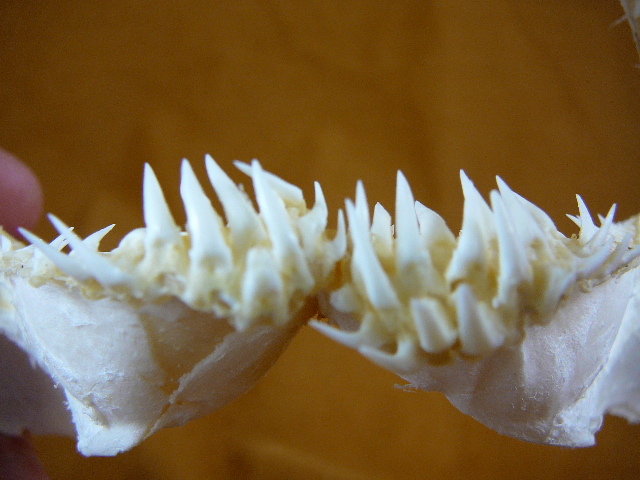 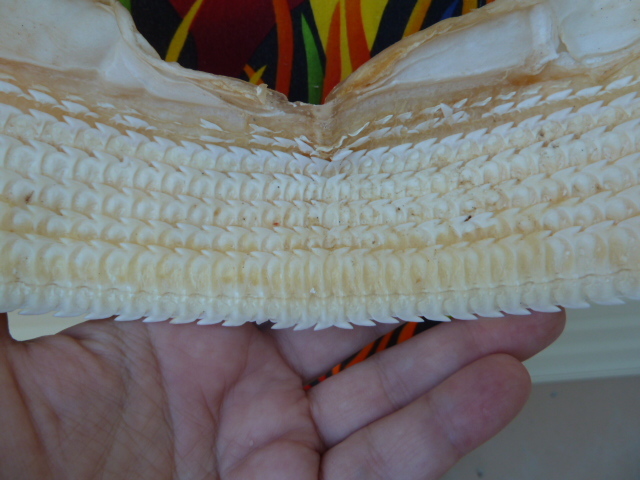 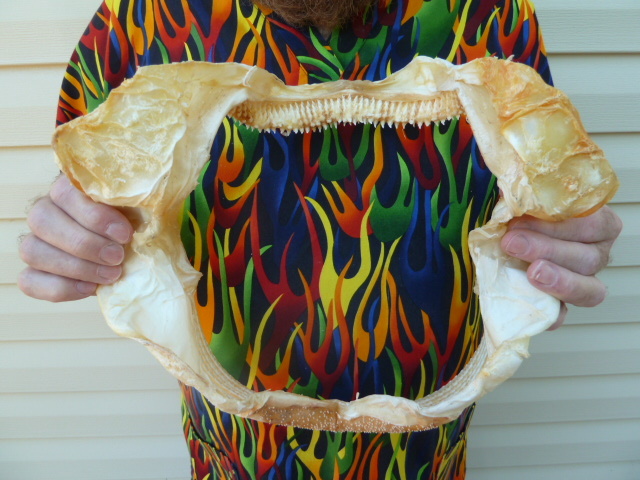 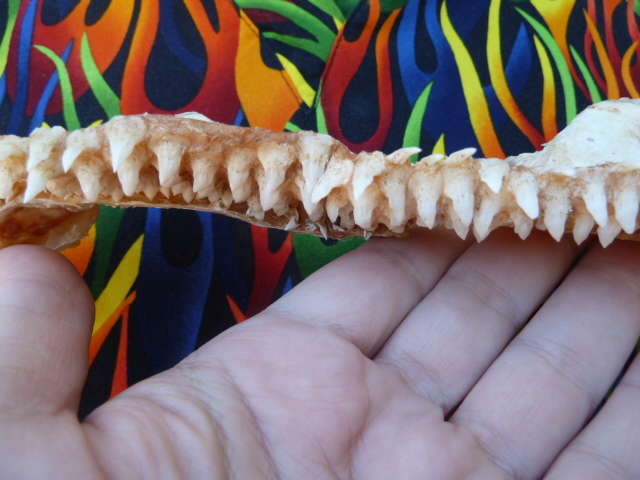 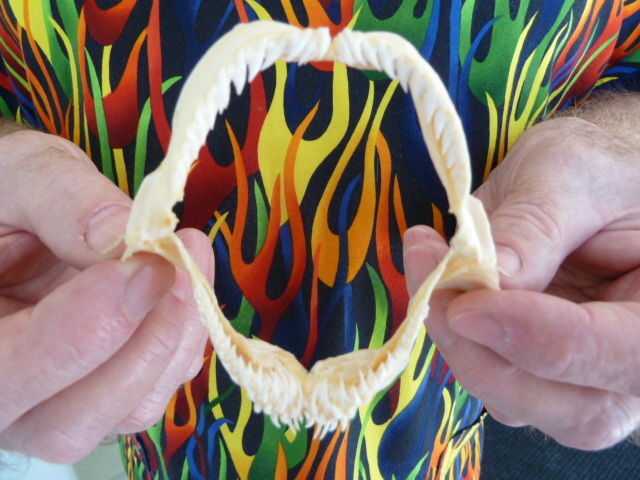 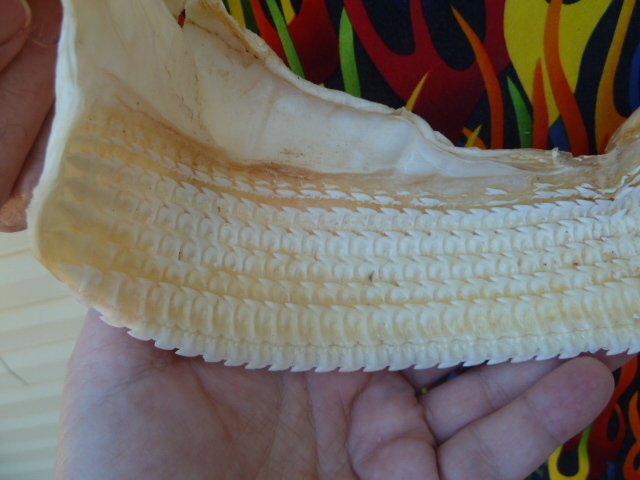 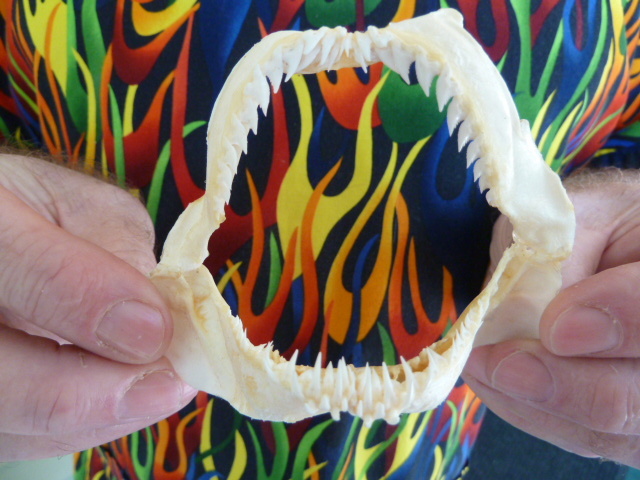 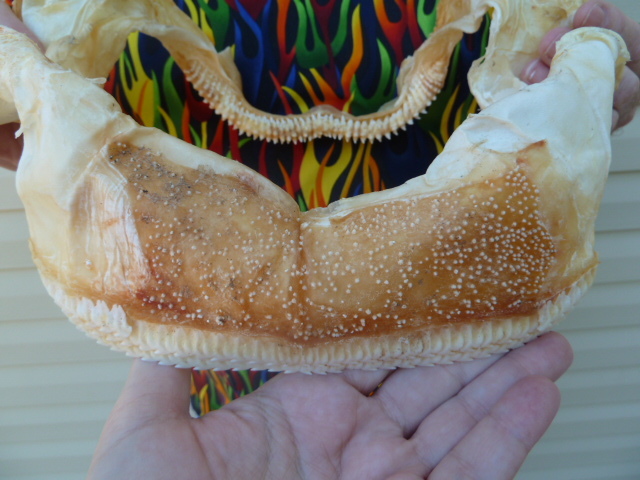 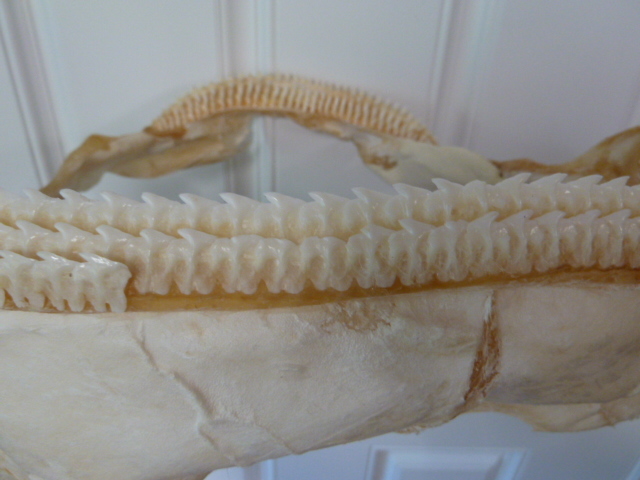 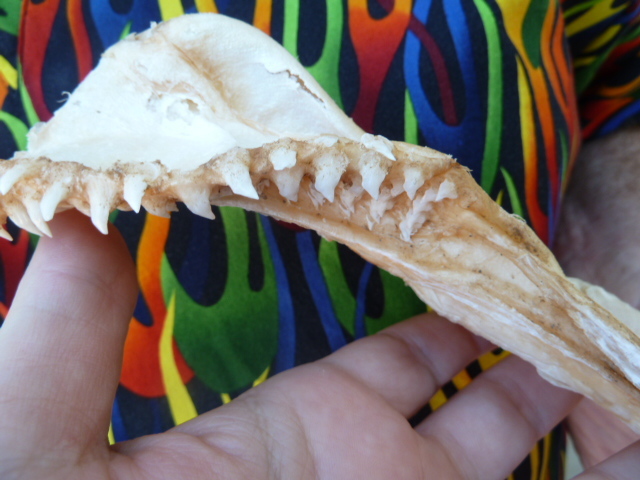 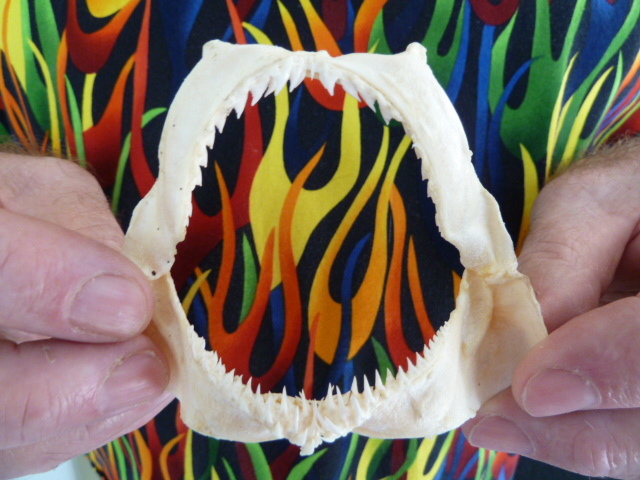 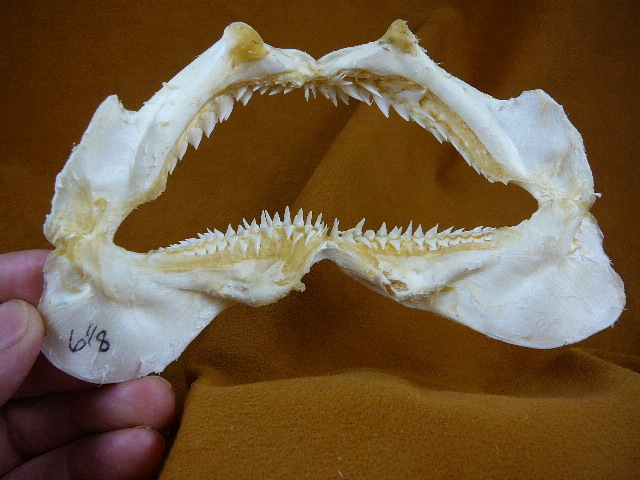 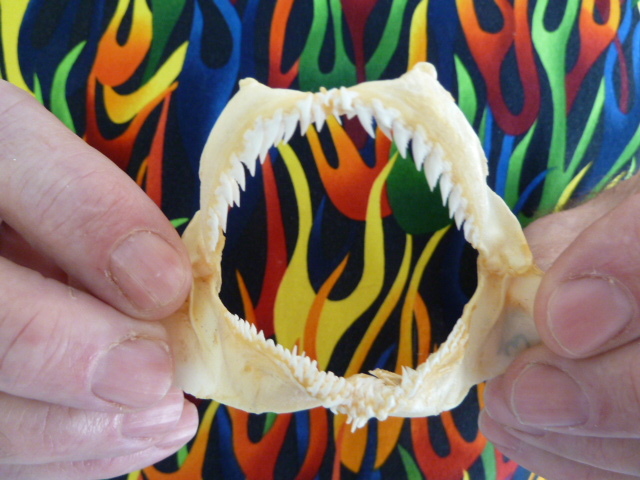 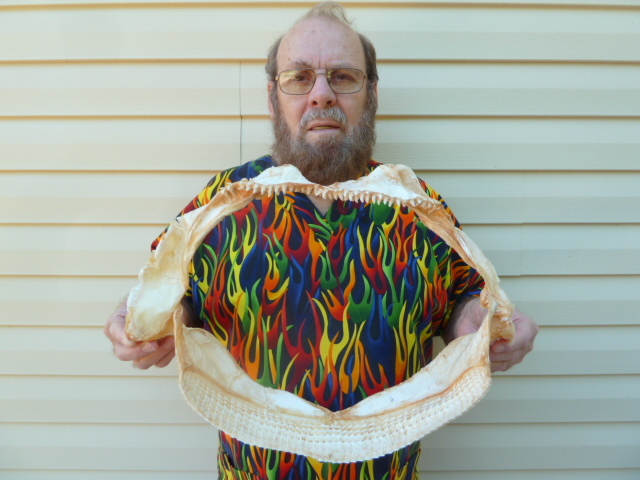 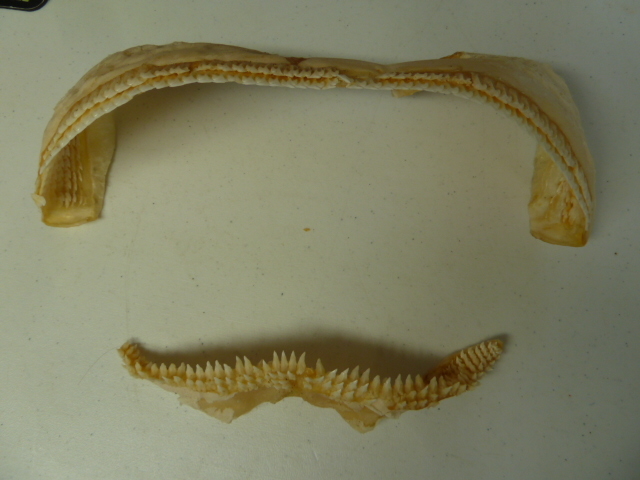 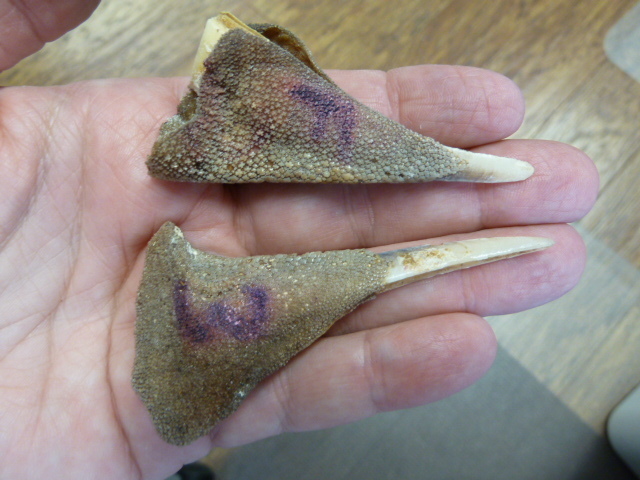 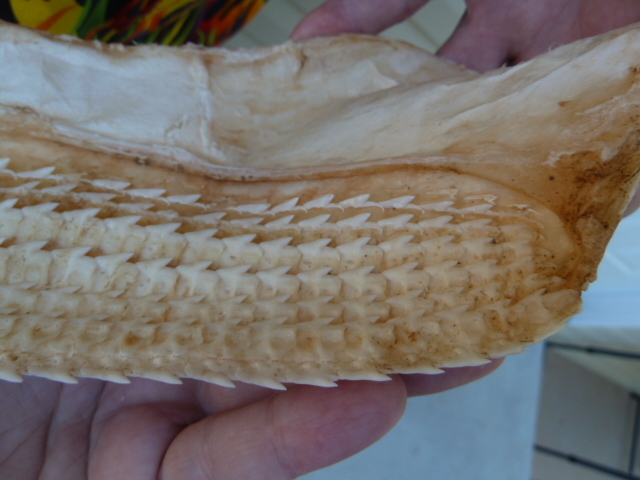 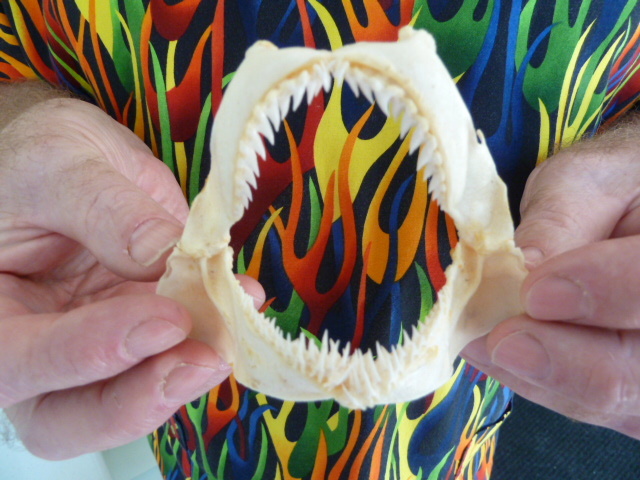 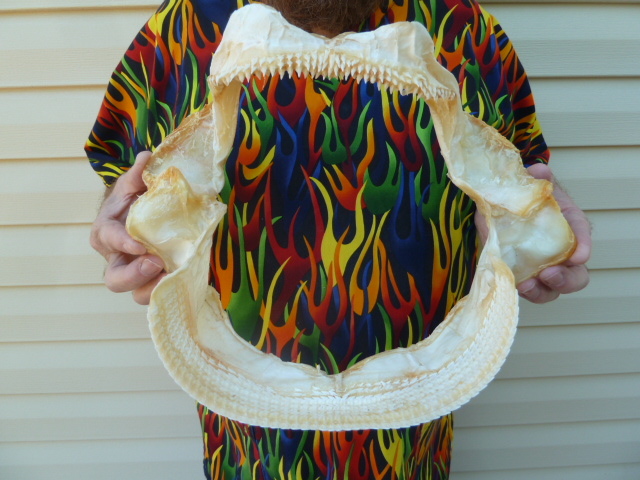 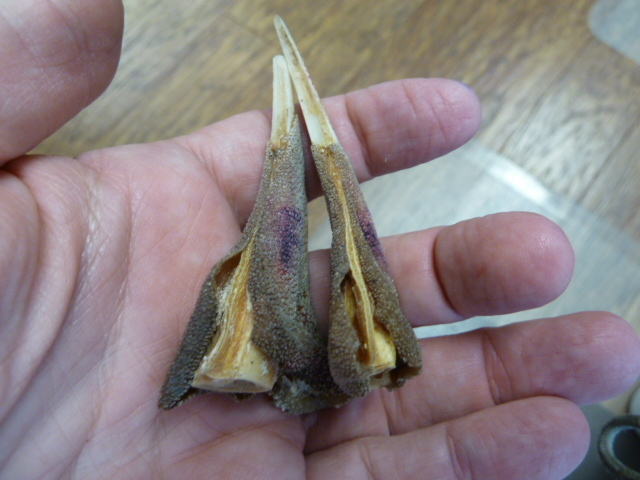 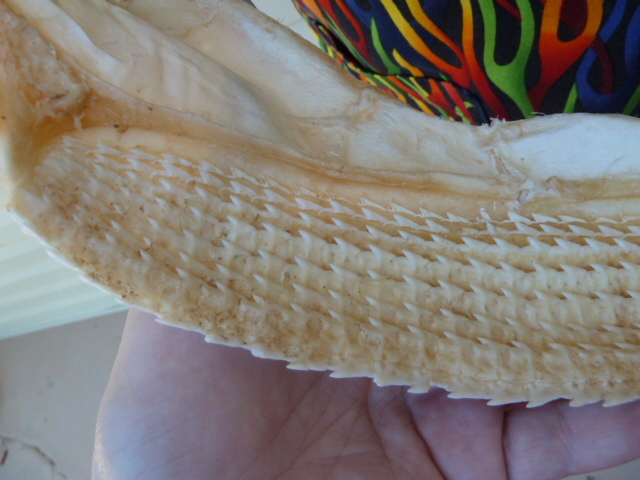 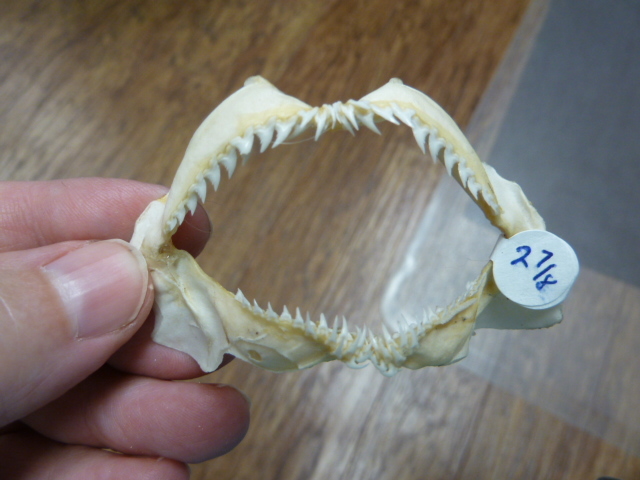 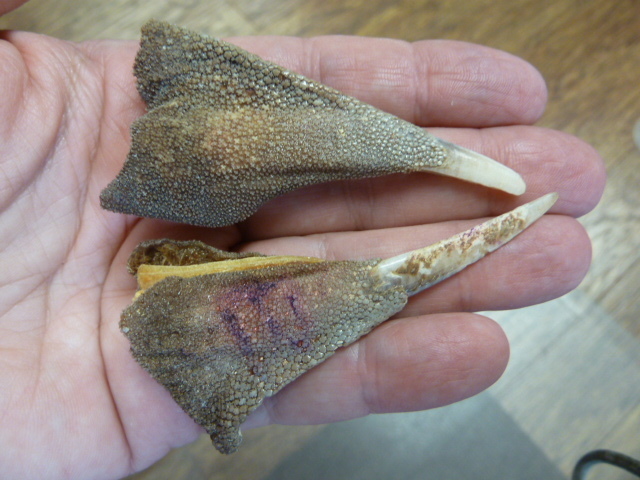 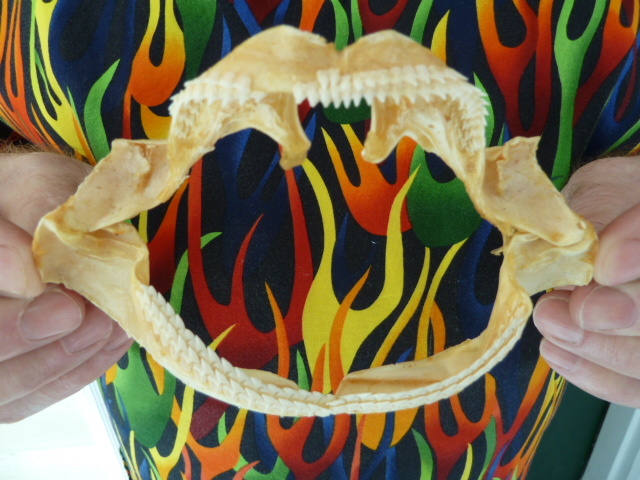 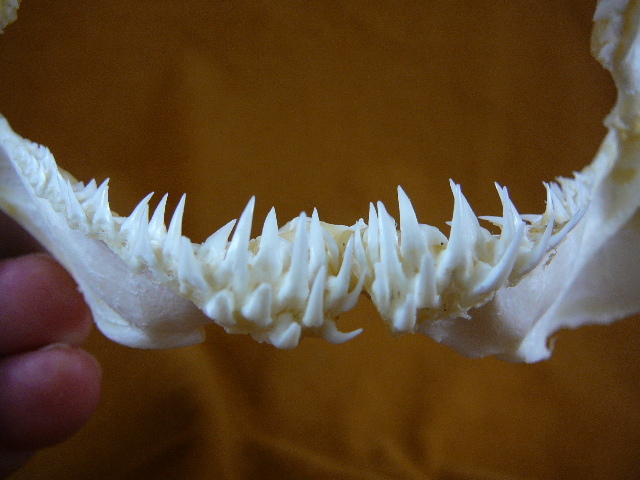 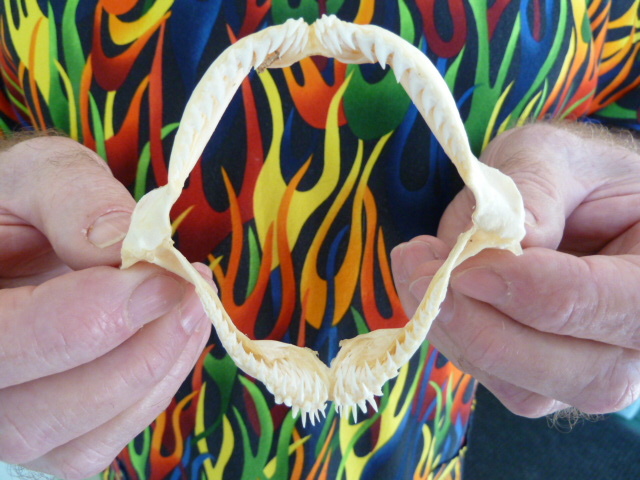 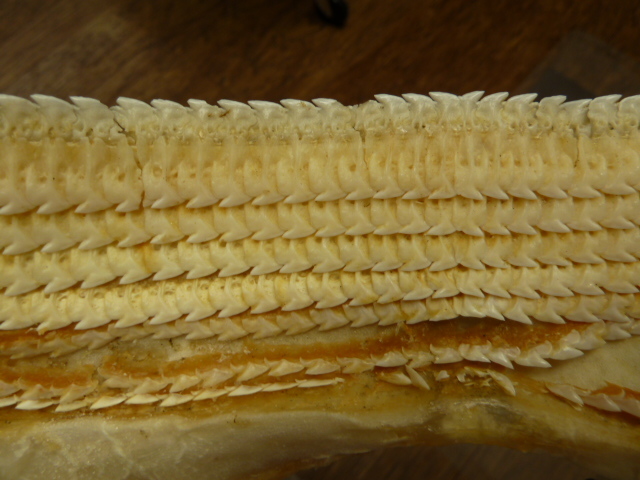 RARE "Gulper" shark (Centrophorus granulosus), Highly unusual teeth, very collectible; 2-1/2" x 2-1/4". 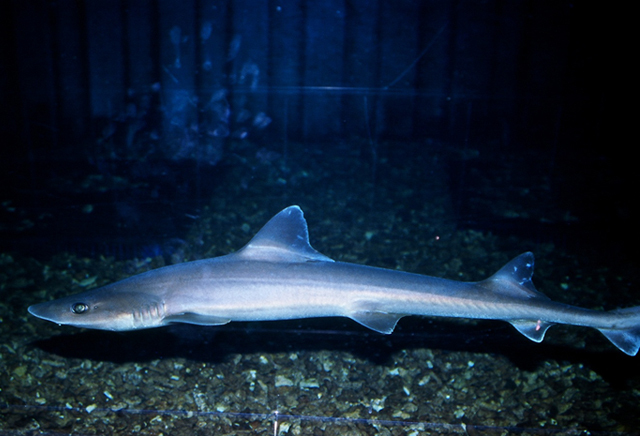 Gulper shark is a large dogfish that has reflective green eyes. 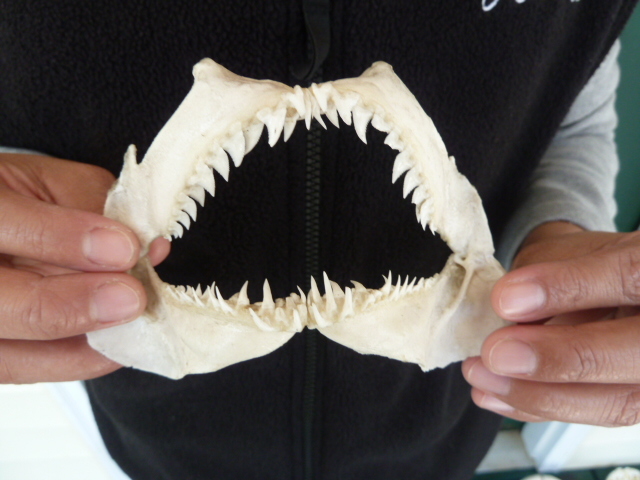 A deep dwelling shark down to 9000 feet, fished off the coast of NW Africa and West-Central Mediterranean, these were caught off the coast of Pakistan. 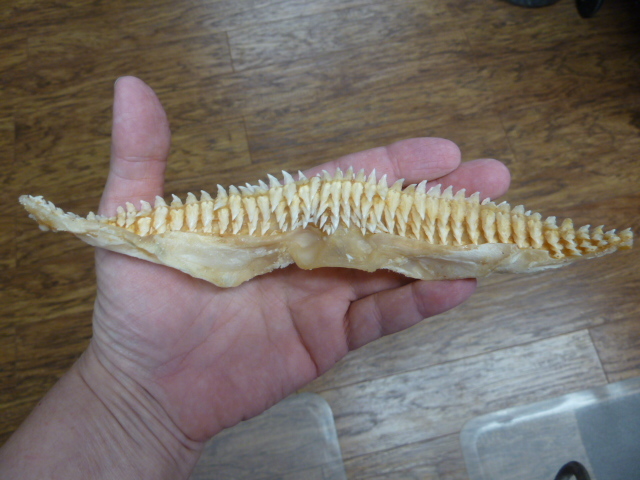 It eats lantern fish and other deep sea bony fishes. 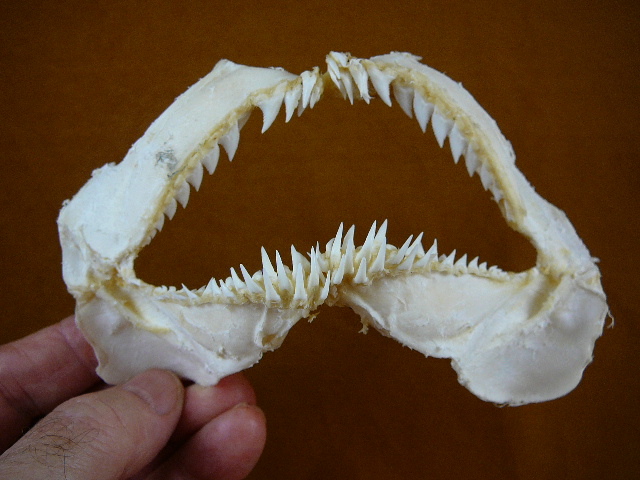 The Giant Taiwan Gulper is a large and rather common deepwater shark of Taiwan. 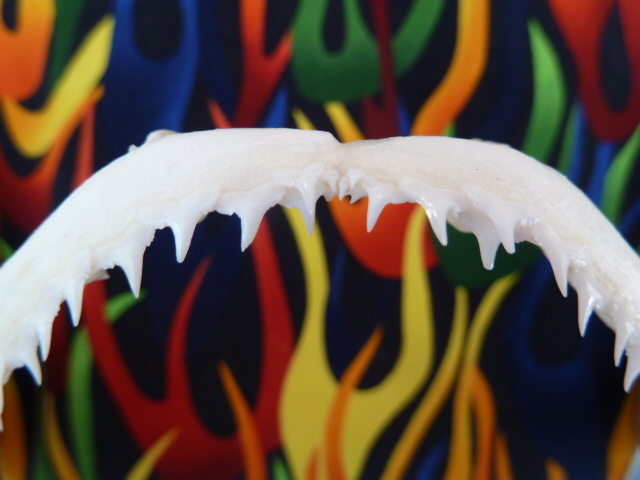 Mostly found below 90m, with a diet rich in bony fish, squid, crustaceans, and even skates. 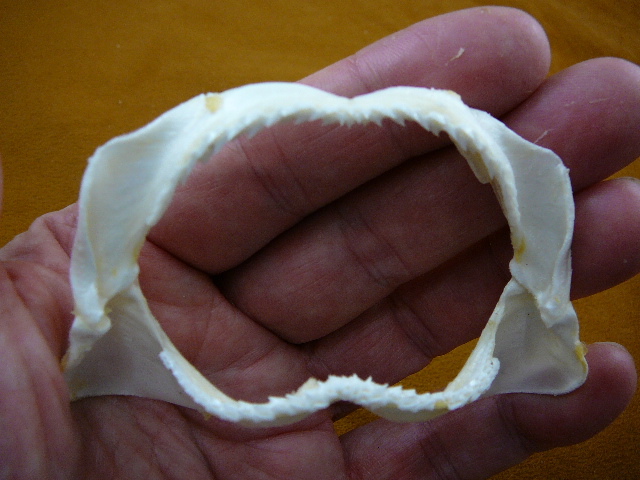 The largest species of hammerhead can grow up to 20 feet, now RARE! 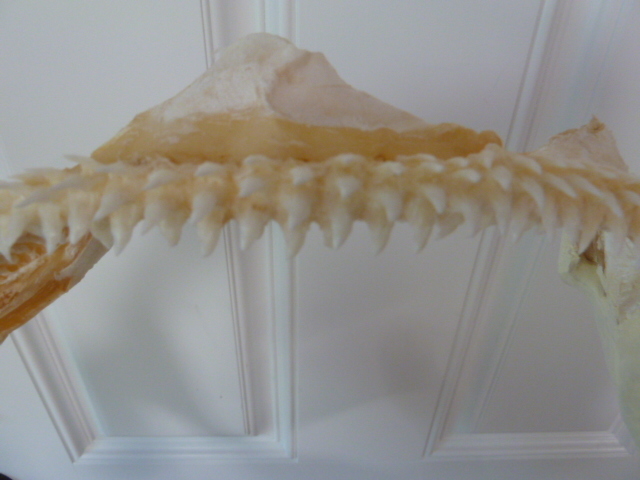 Scalloped hammerhead is also known as bronze, kidney-headed or southern hammerhead and is the most common species of hammerheads. 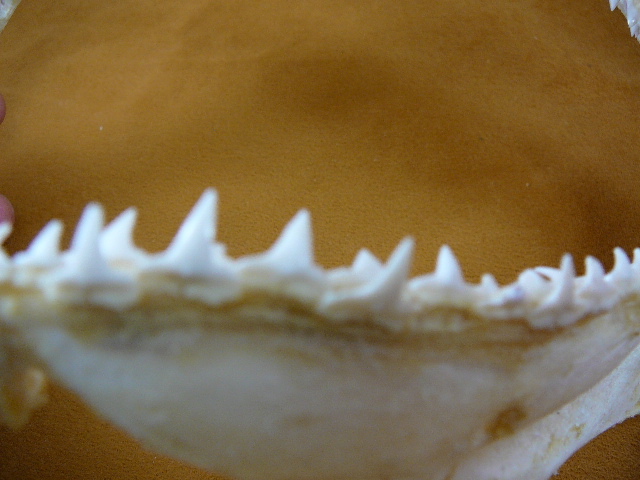 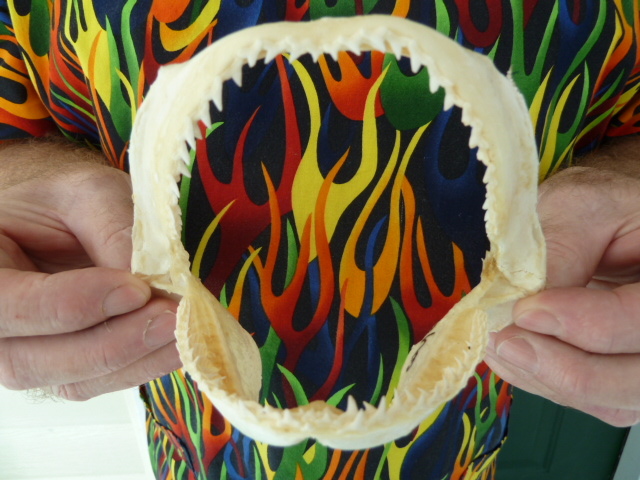 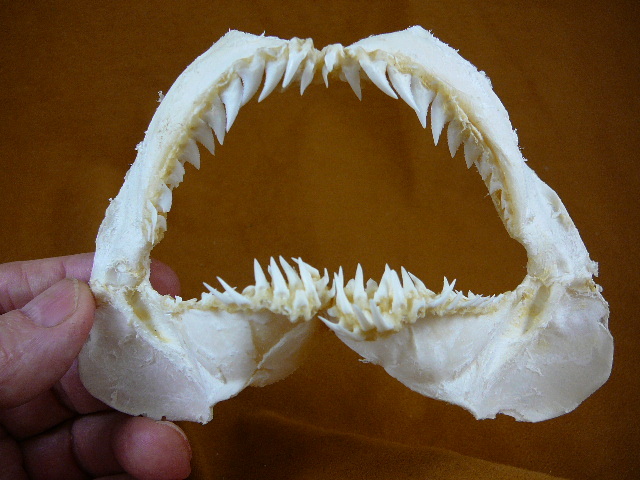 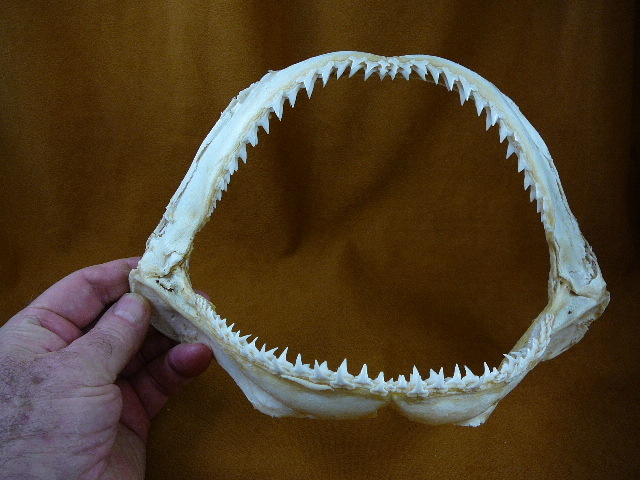 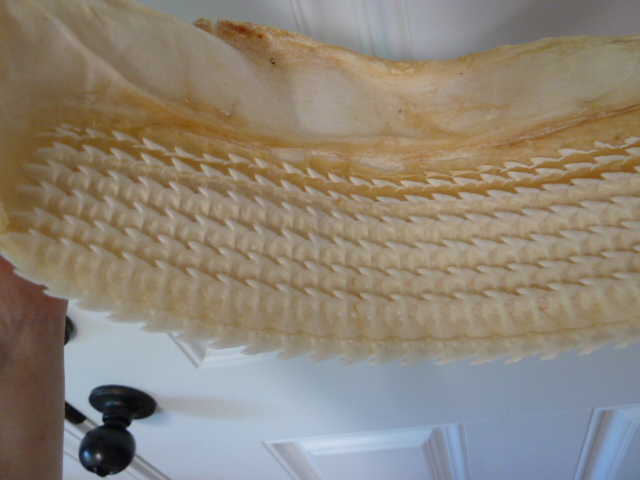 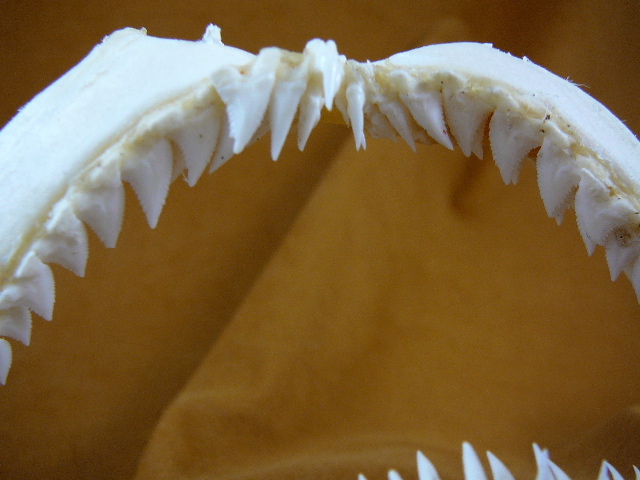 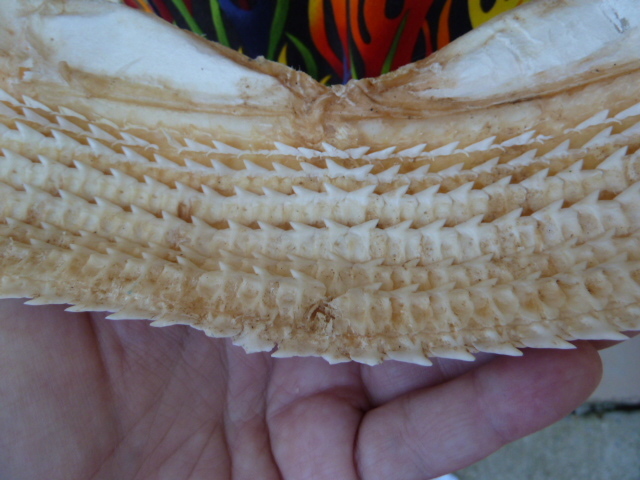 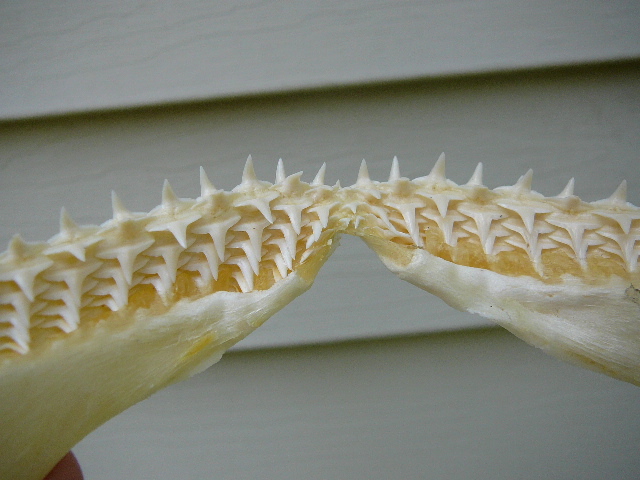 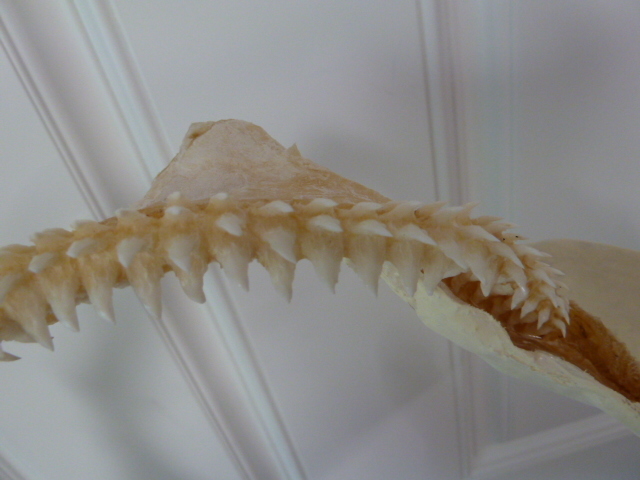 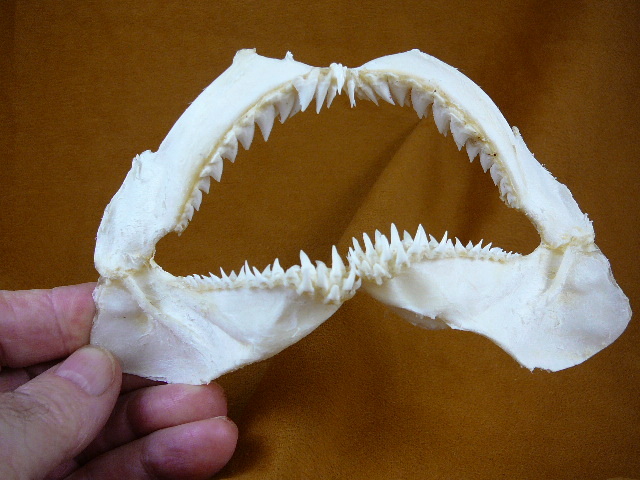 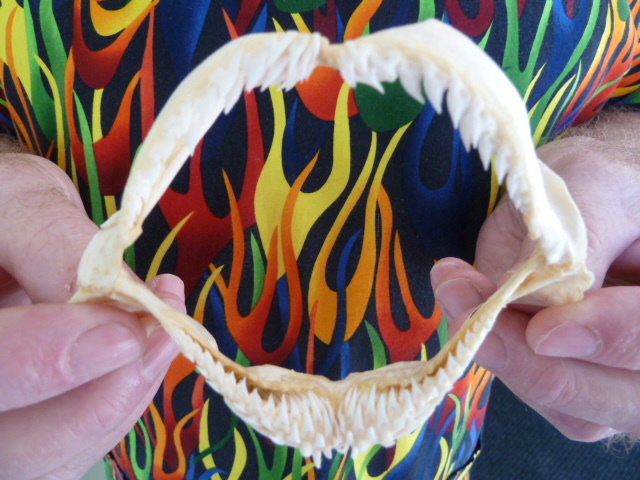 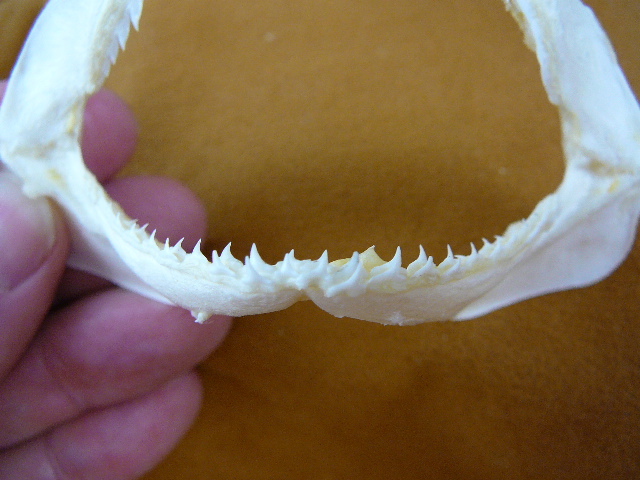 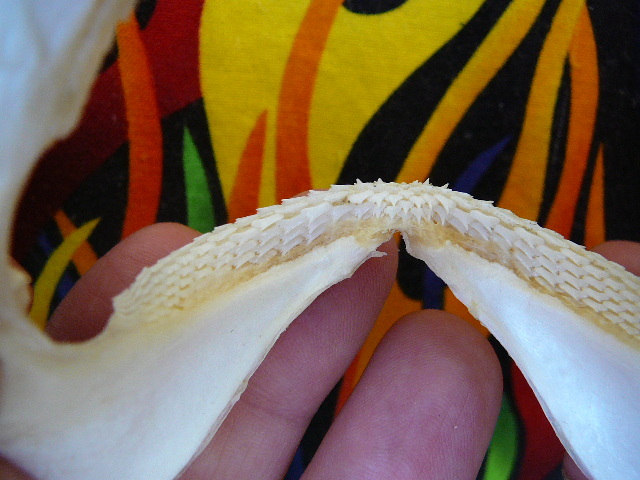 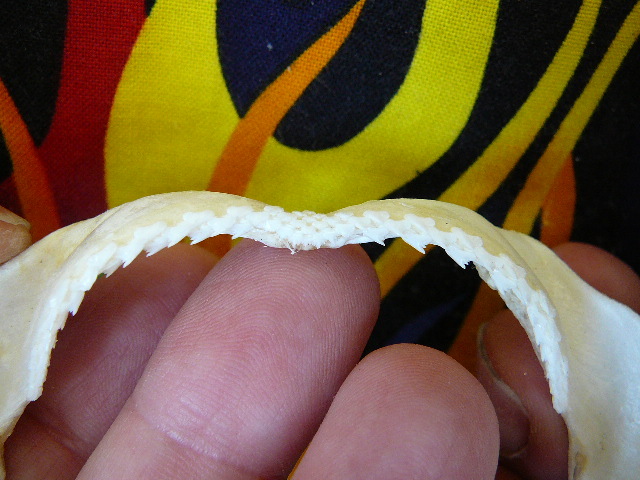 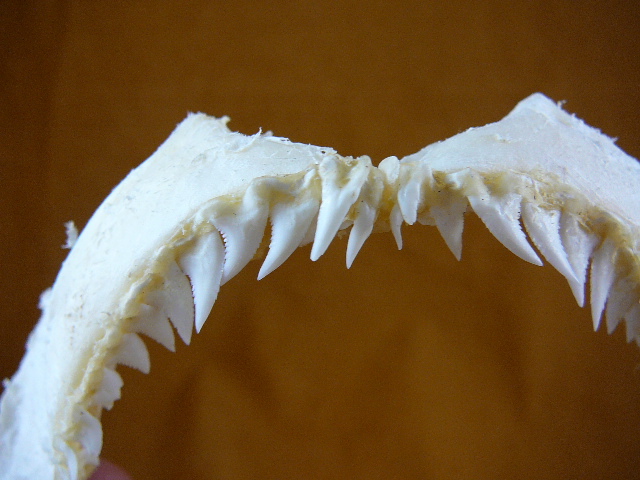 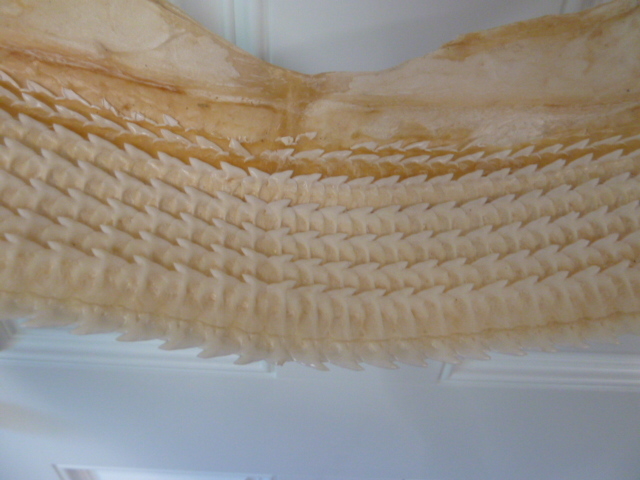 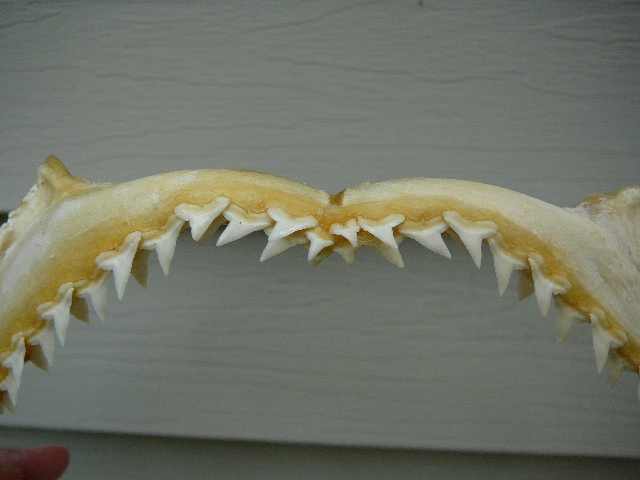 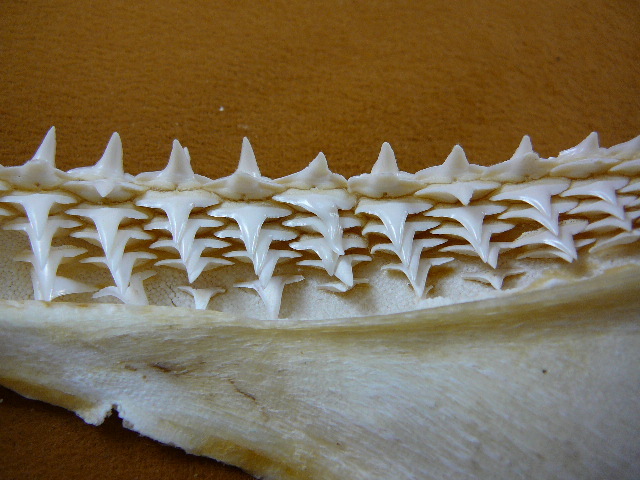 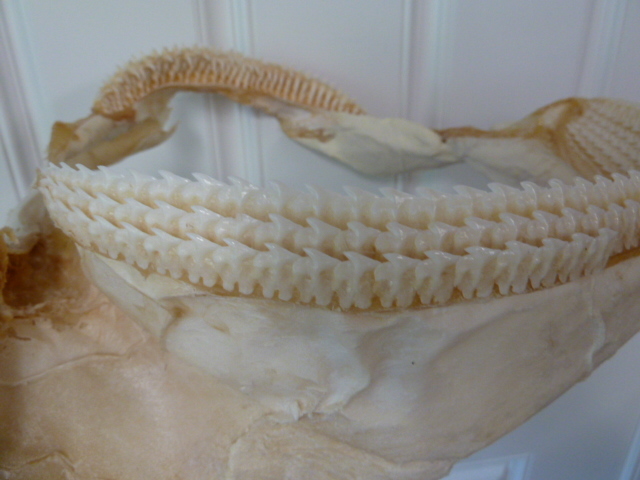 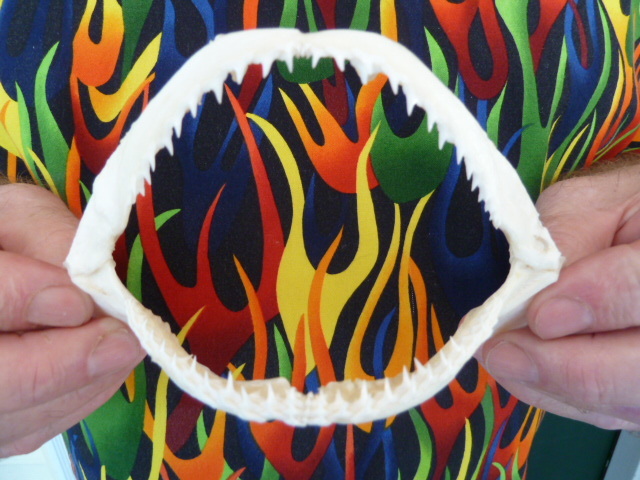 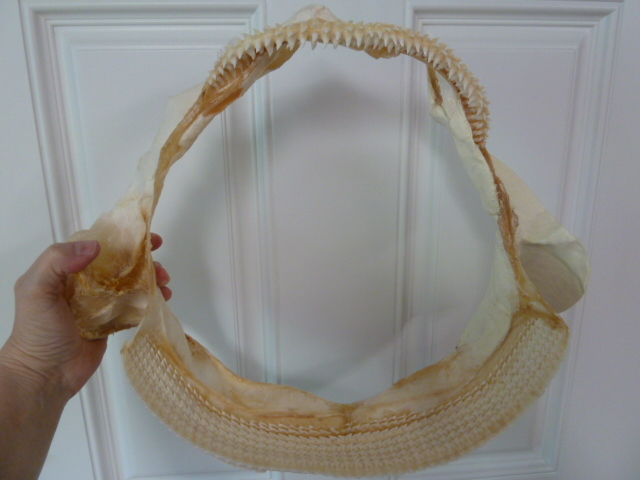 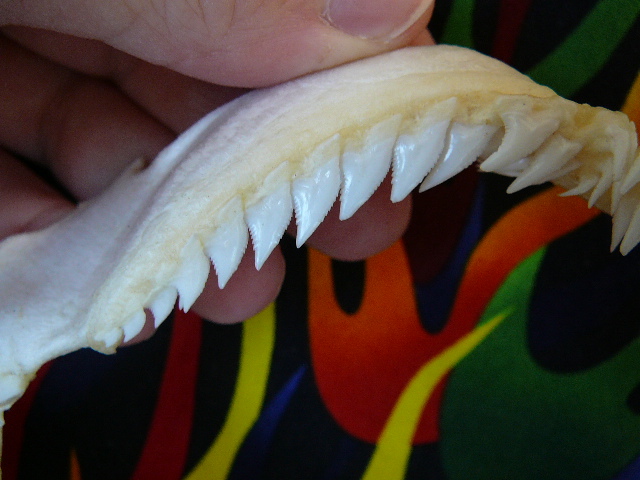 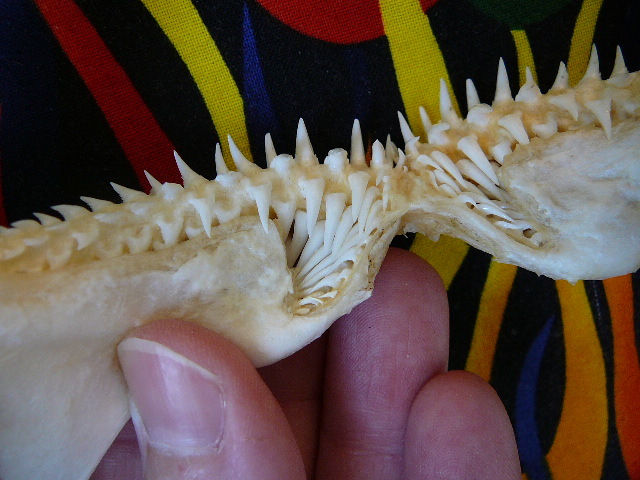 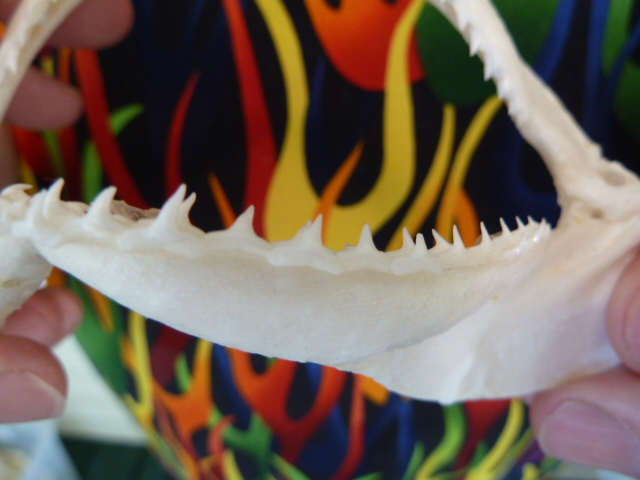 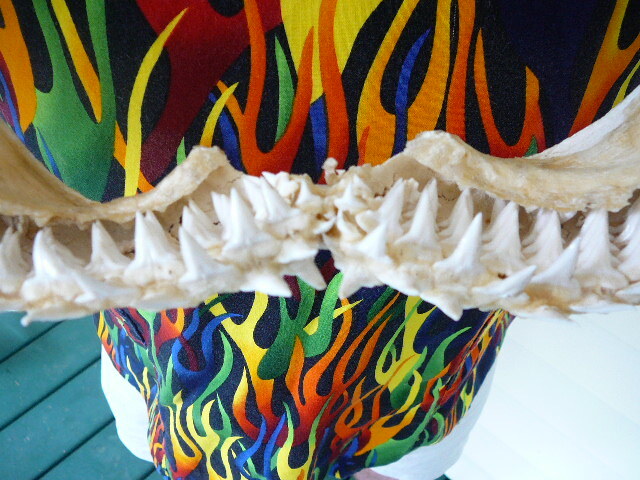 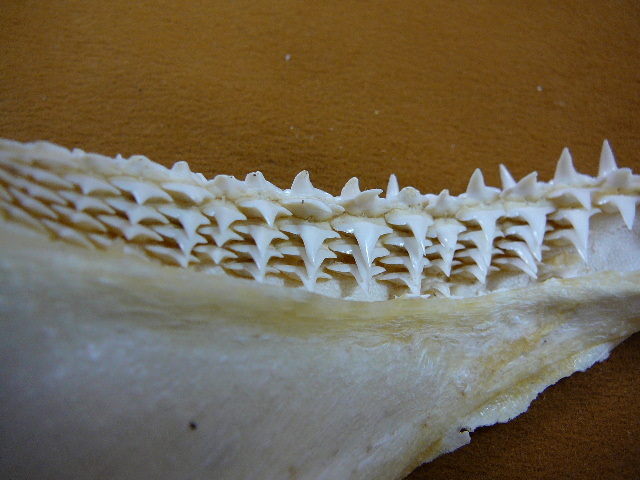 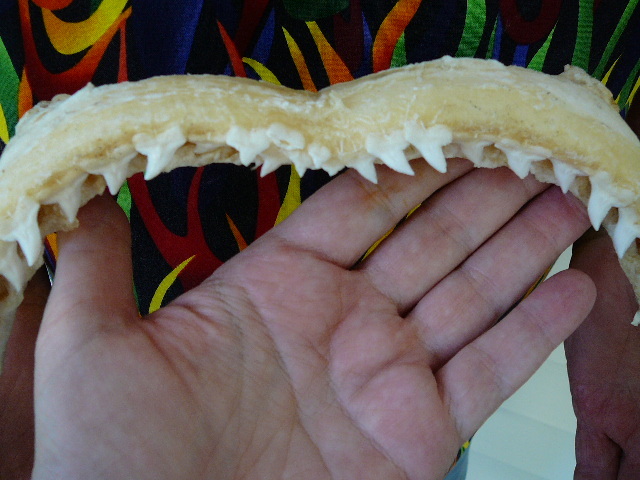 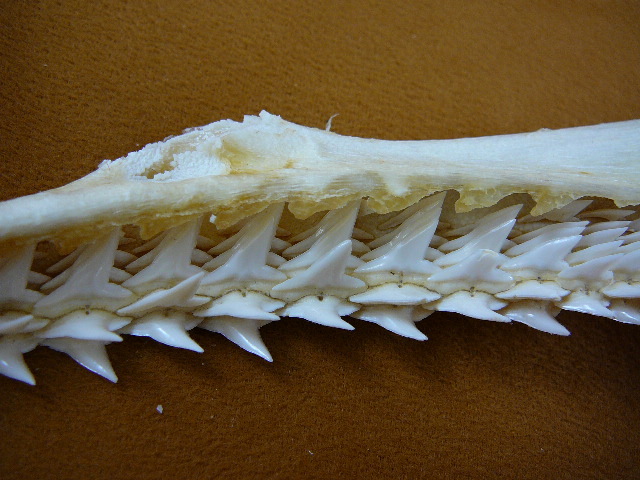 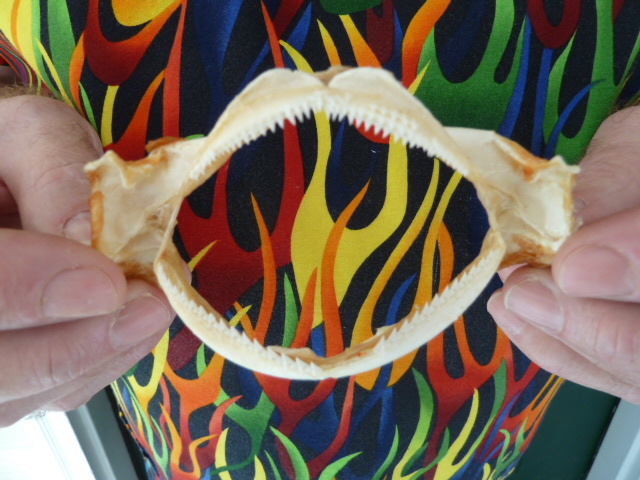 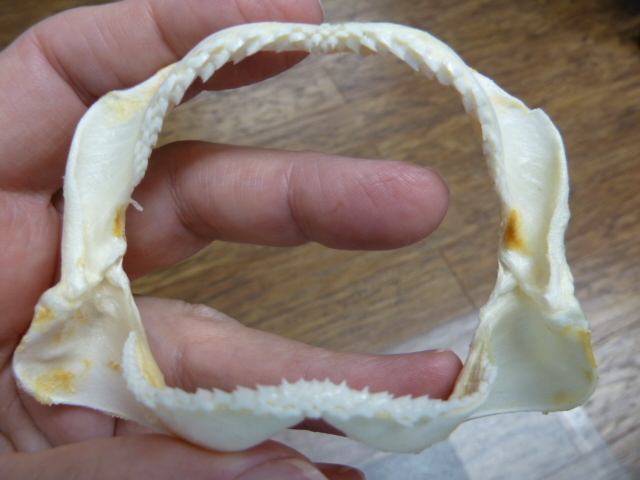 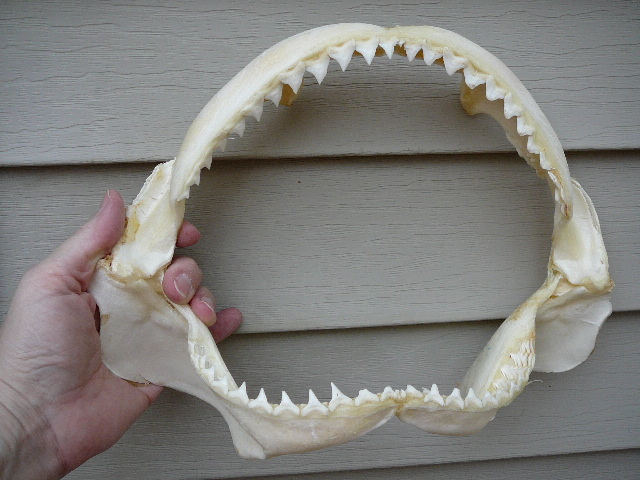 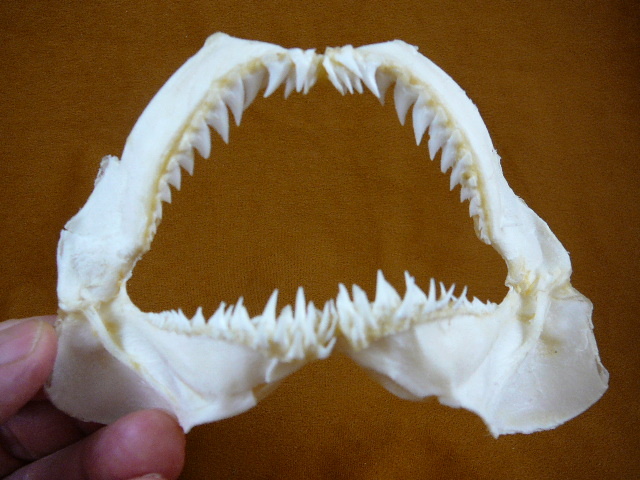 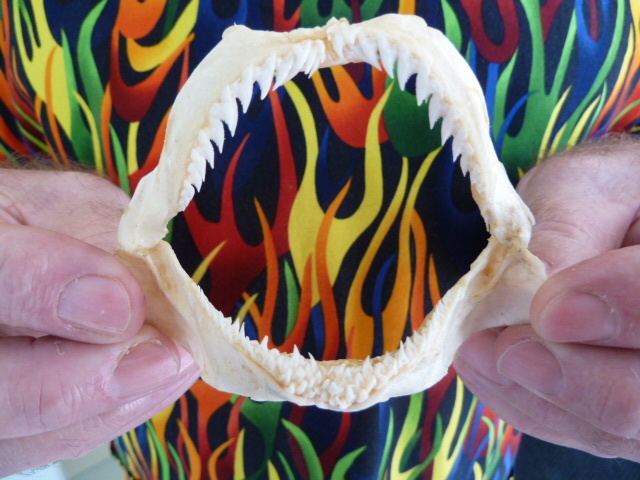 Scalloped has a narrower jaw and 16 upper teeth on each side of the upper jaw. 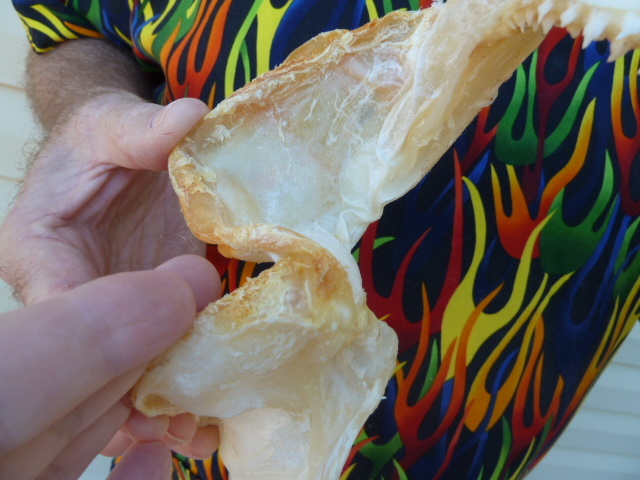 Individually photographed, you get exactly what you see in the photo. 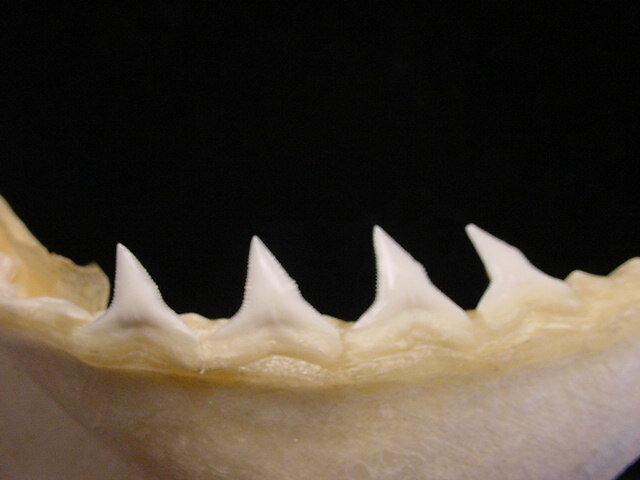 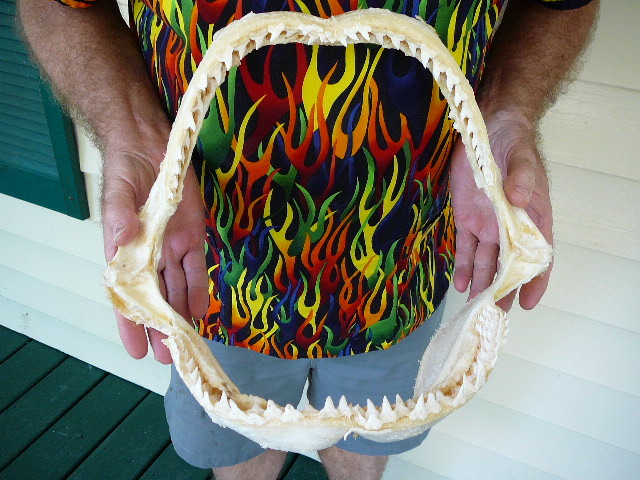 Photographed top (dark side) and bottom (showing jaw). 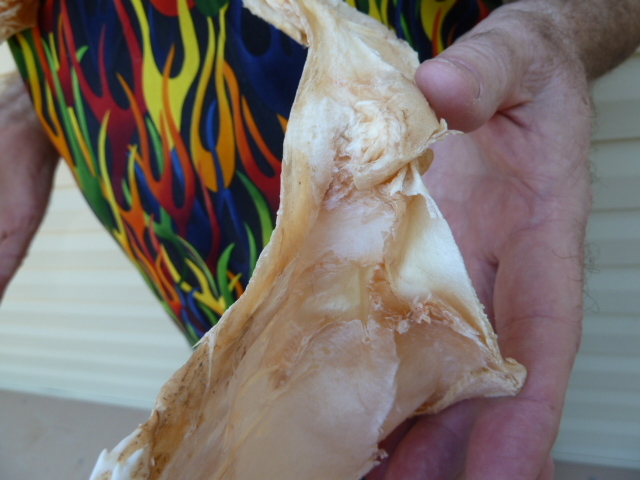 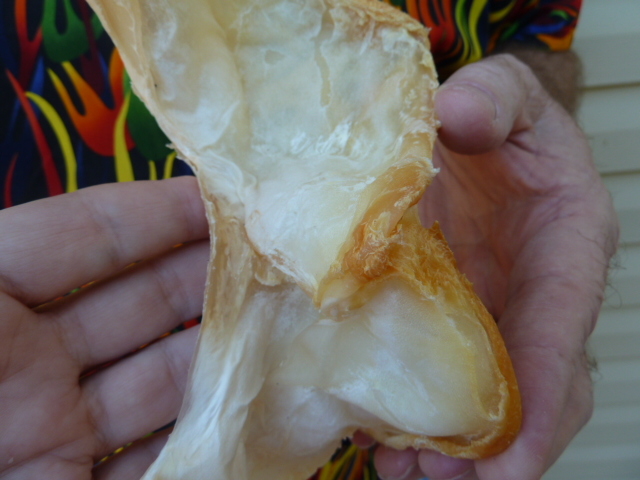 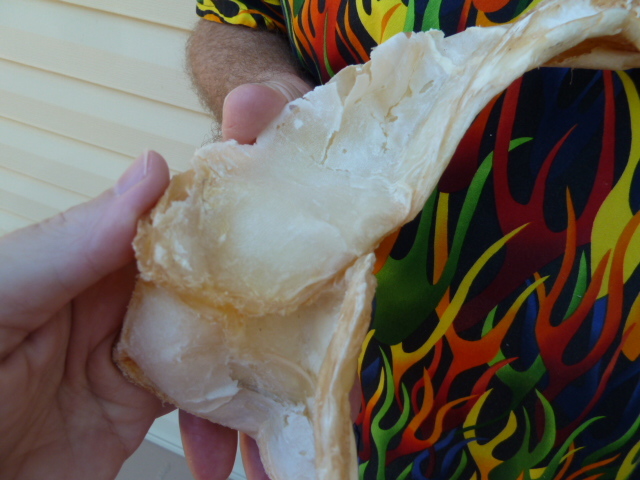 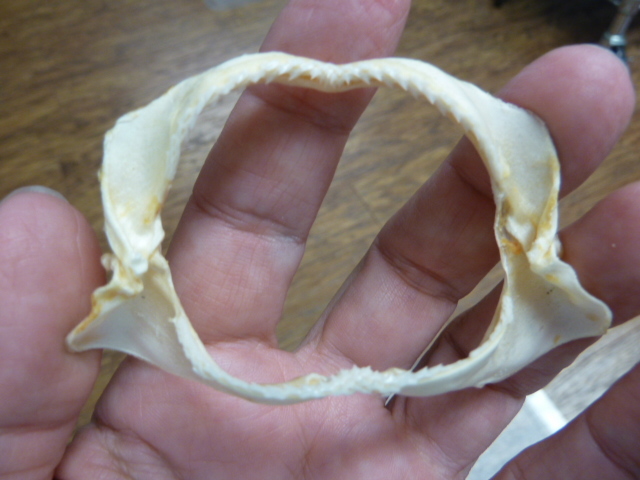 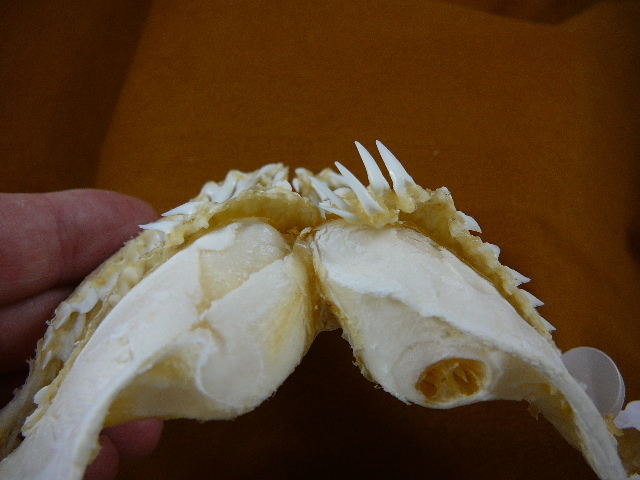 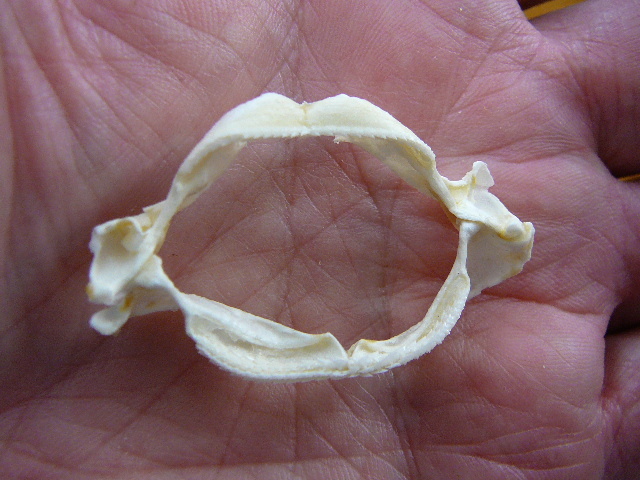 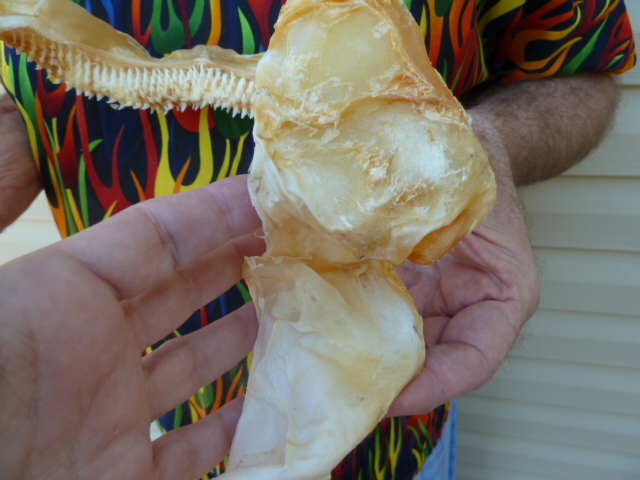 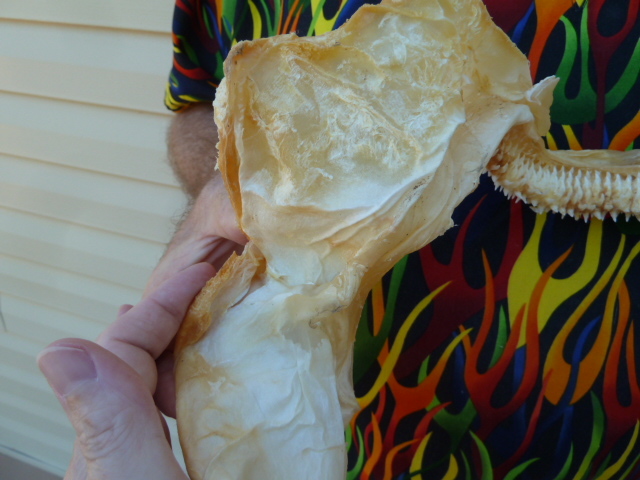 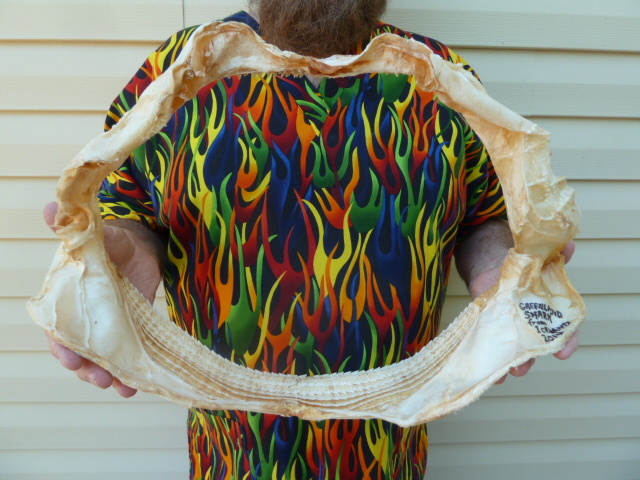 The end shows where it was cut off at the back "bone" cartilage. 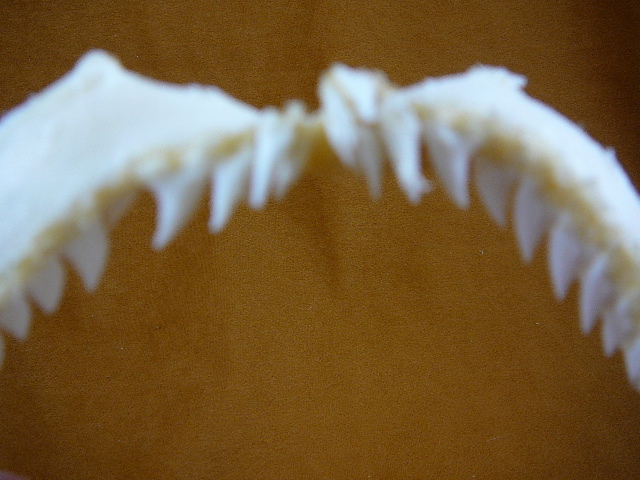 Jaw opening averages 2 x 2-1/2"; heads average 7" wide. 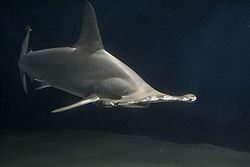 Smooth hammerhead is also known as Common, Common Smooth, Round-headed, and Simple Hammerhead; relatively common. 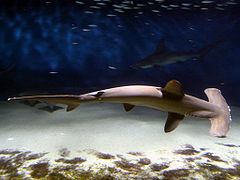 Being as big as 16 feet long is the second largest of its species to the Great hammerhead. 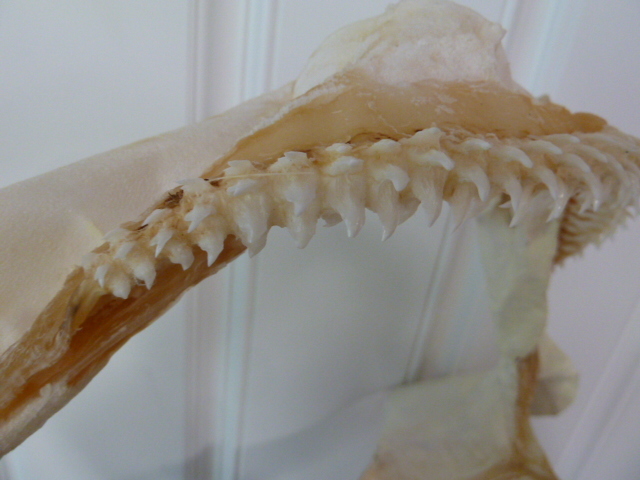 Close relative to the Scalloped hammerhead, though the Smooth has a much wider jaw with usually 14 upper teeth on each side of the upper jaw. 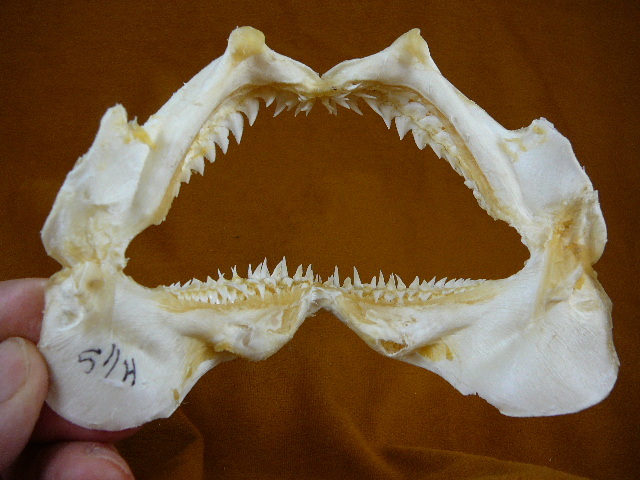 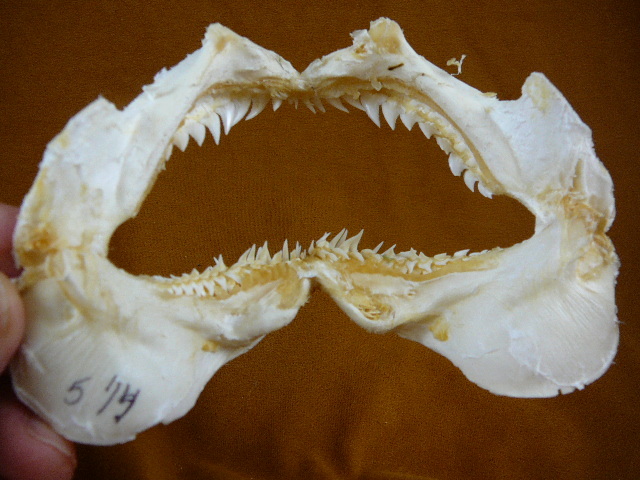 Hardnose is a requiem shark of the family Carcharhinidae, found in the Indo-West Pacific oceans. 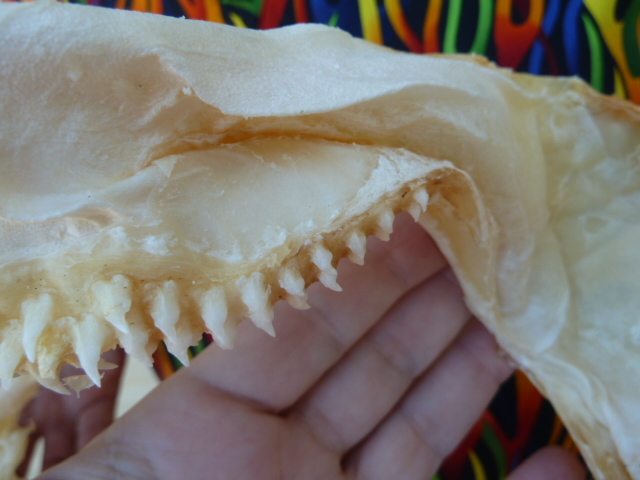 The snaggletooth shark, Hemipristis elongatus, is a species of weasel shark, family Hemigaleidae, and the only extant member of the genus Hemipristis. 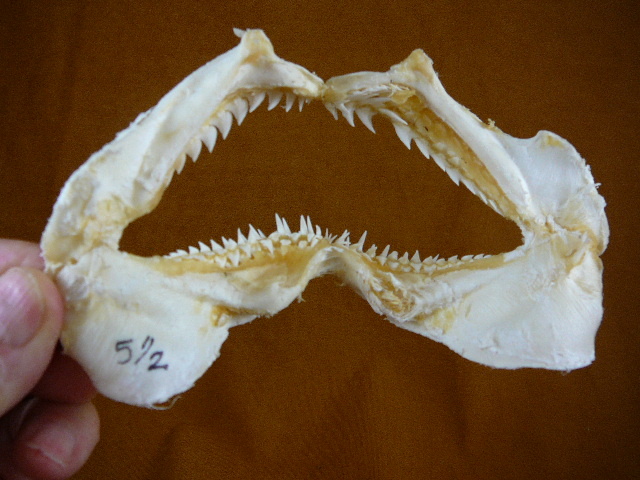 It is found in the Indo-West Pacific, including the Red Sea, from southeast Africa to the Philippines, north to China, and south to Australia, at depths of from 1 to 130 m. This shark can be found near the bottom of the water column of coastal areas, but can be found at continental and insular shelves. 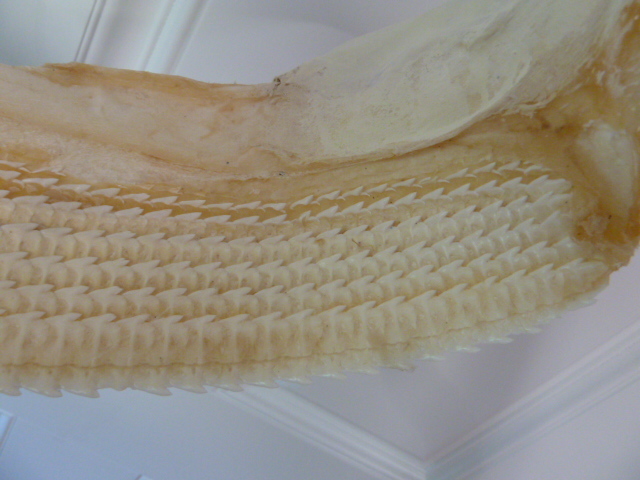 Its length is up to 3.81 m (12.5 ft) and it can weigh up to about 500 kg. 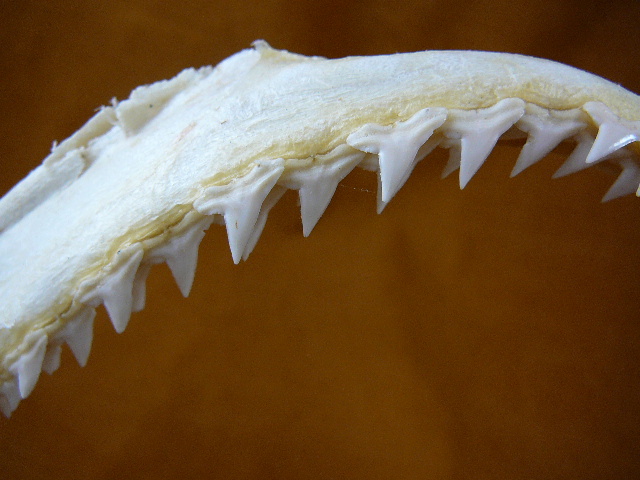 Despite being only vulnerable to extinction, this is a very rarely seen shark. 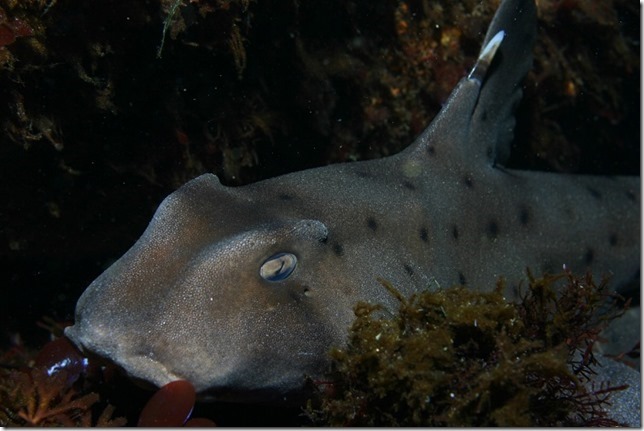 Horn shark is a species of bullhead shark and commonly found of the West Coast of California. 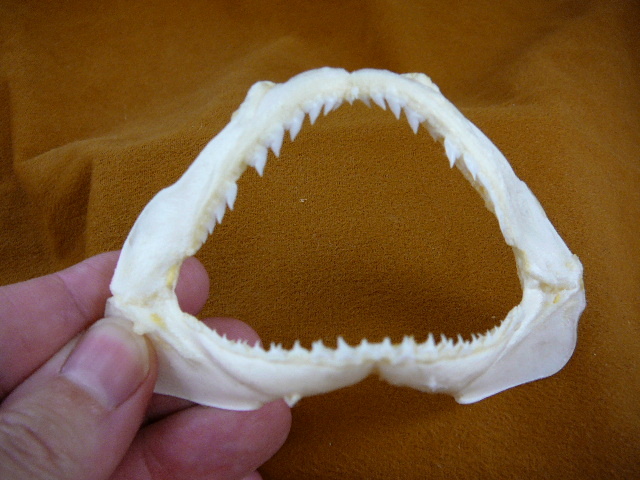 Japanese tope shark is in the hound shark family, max. 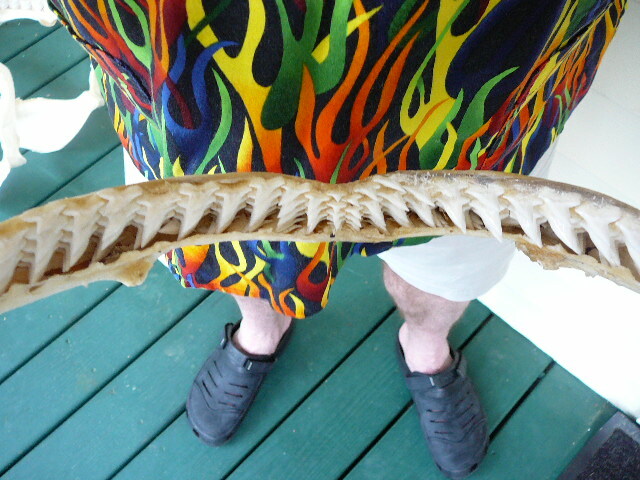 length is just over 3 feet long.